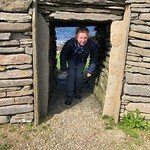 I have stayed three times, now, at the wonderful Unigar Cottages, and ought really to give them a plug. 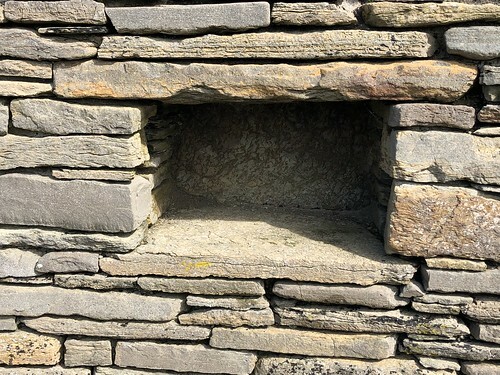 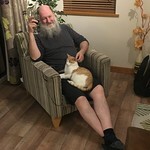 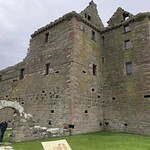 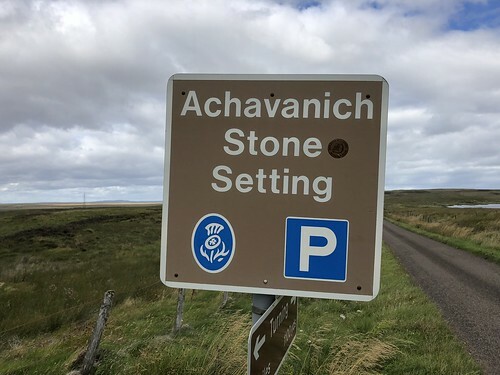 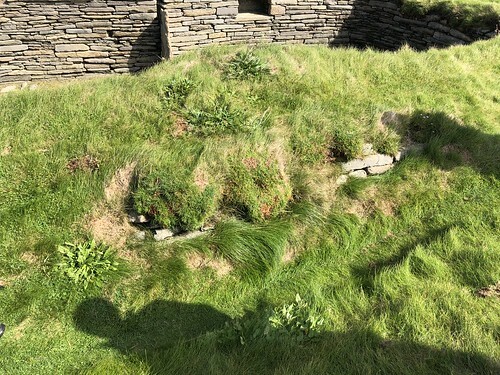 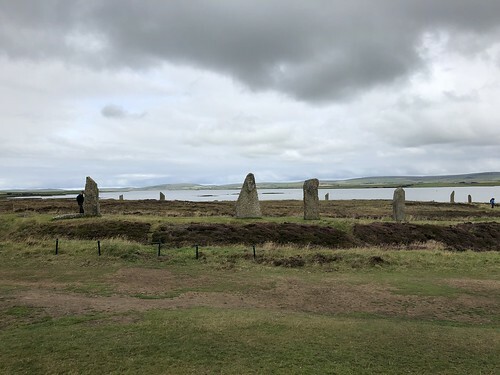 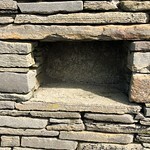 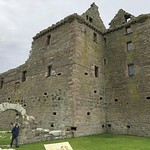 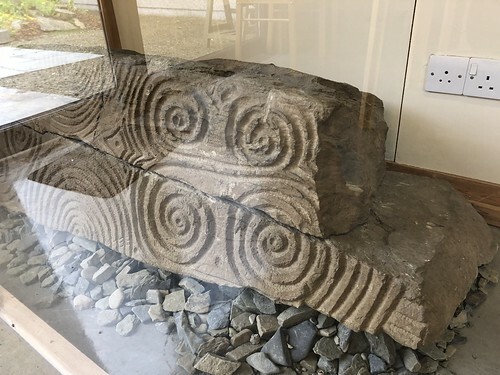 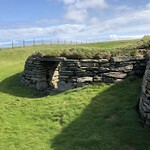 Very comfortable, well appointed, and in a quiet part of the island near to Scara Brae, but only 25mins drive from Kirkwall and less to Stromness, and only 10mins to the Ness of Brodgar. 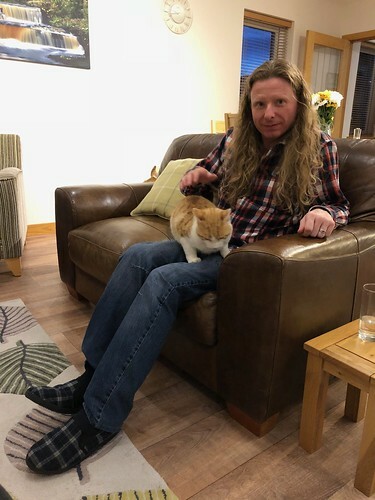 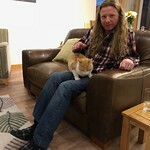 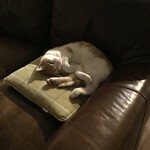 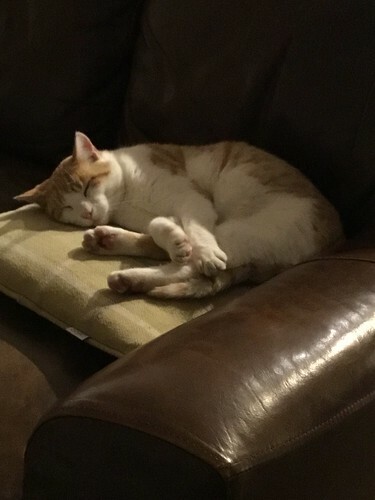 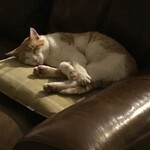 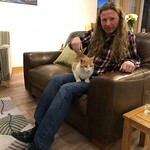 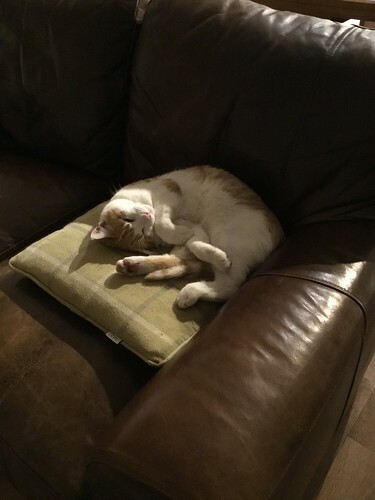 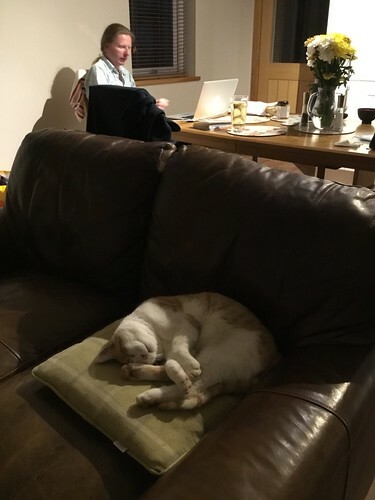 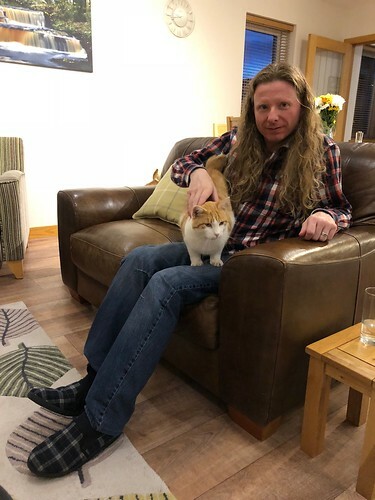 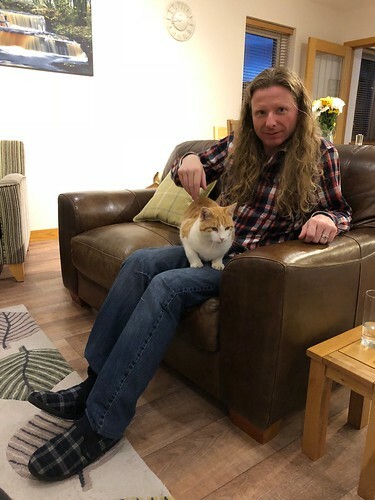 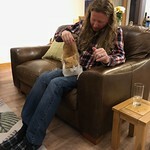 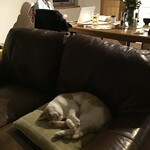 Here, too, this time, we have befriended a young ginger tom, who has delighted our evenings with his skittish affection. 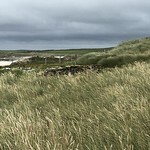 Orkney also has some fabulous restaurants, including the wonderful Foveran, where we had this year’s Wedding Anniversary dinner, and a fantastic evening it was too! 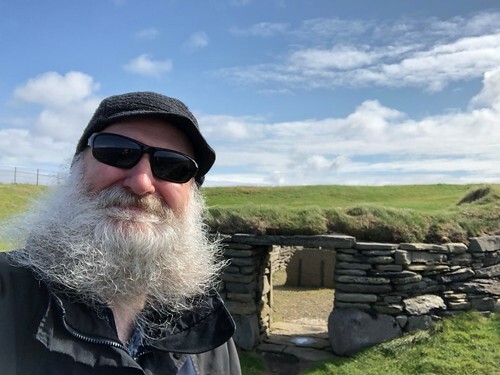 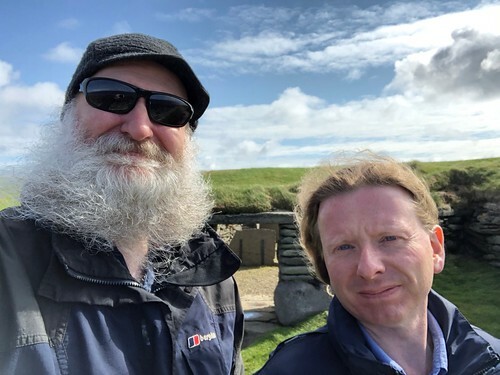 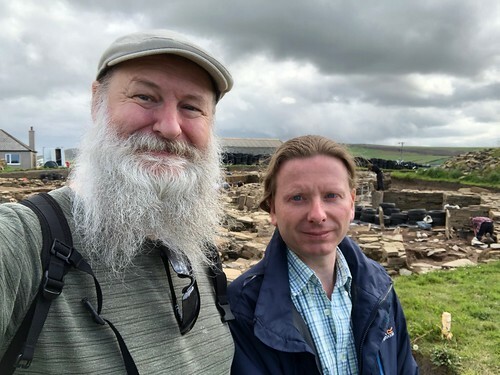 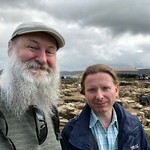 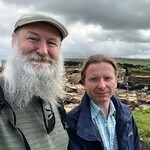 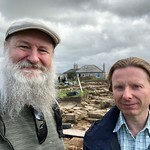 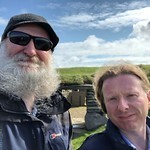 In the summer of 2018, Colin and I returned to the Orkneys. 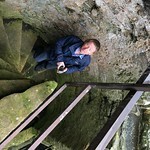 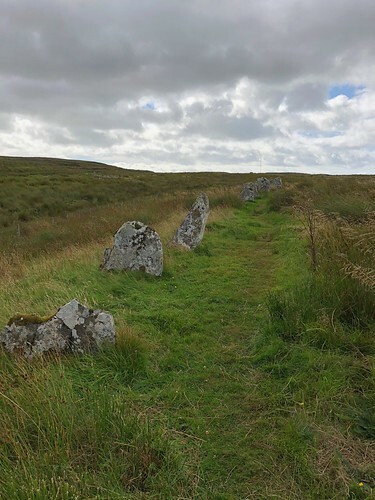 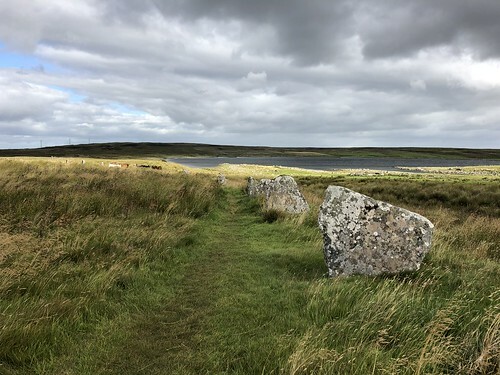 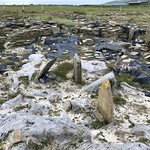 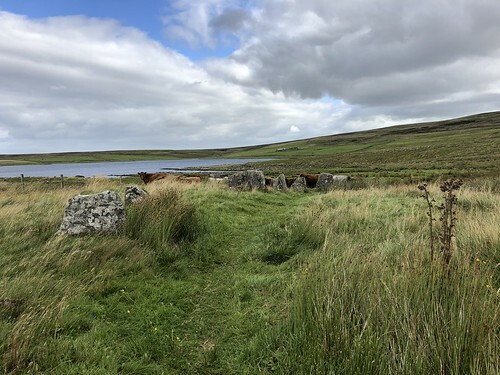 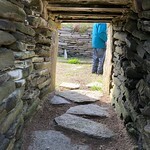 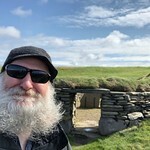 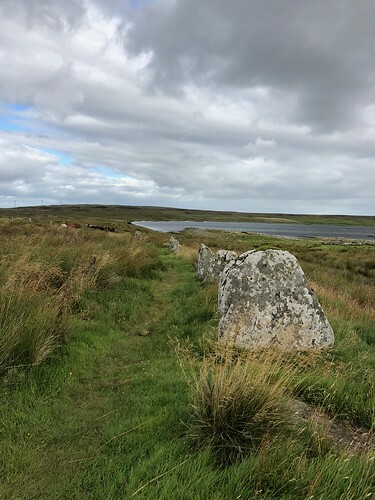 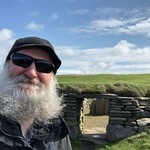 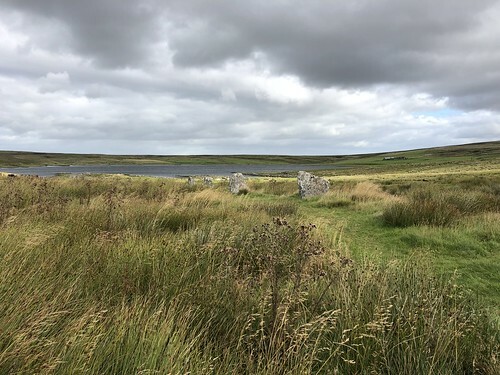 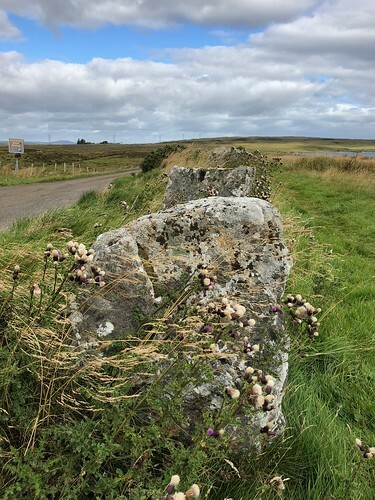 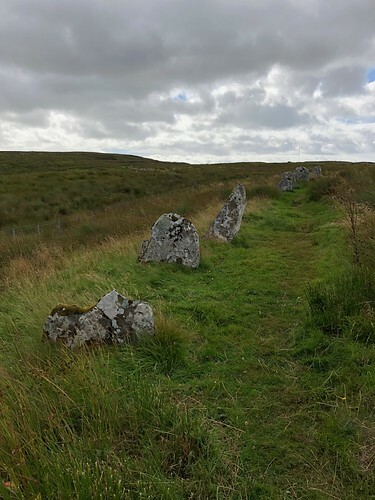 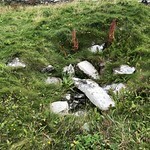 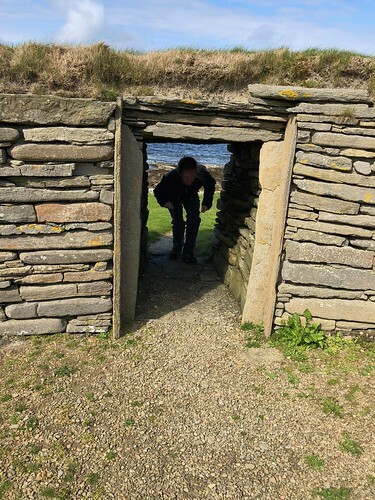 On our visit in 2015 we had seen pretty much all there is to see on the ‘mainland’ island, and taken the quick and easy crossing to Rousay to see the four chambered cairns in a row there, including the impressive MidHowe. 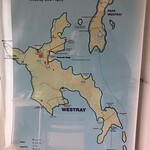 This time, we’re here for a fortnight, with many of the other smaller islands as our principal goal. 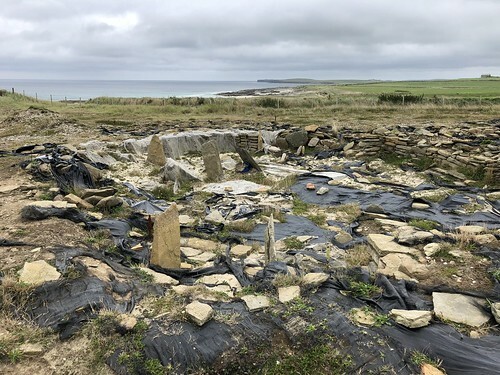 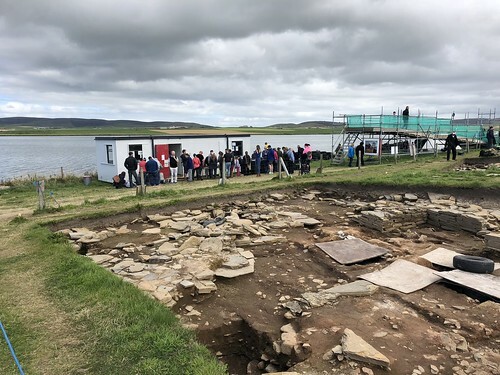 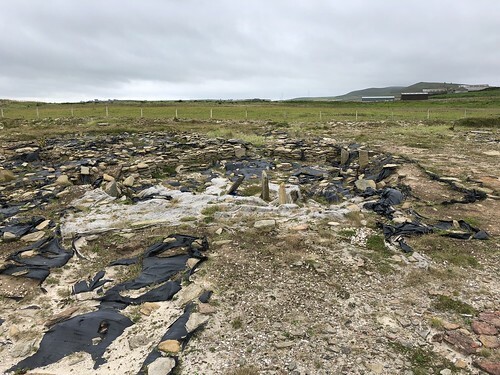 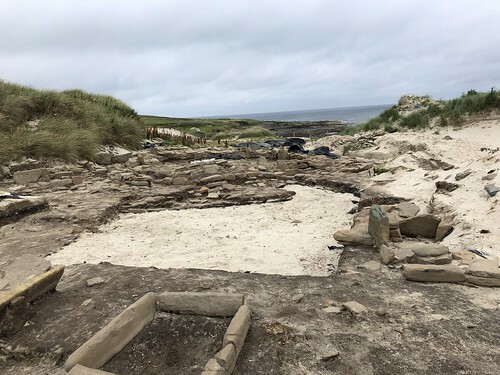 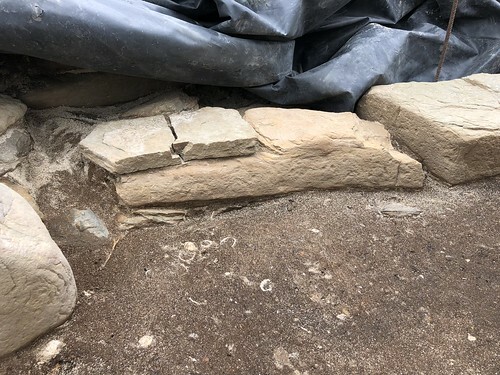 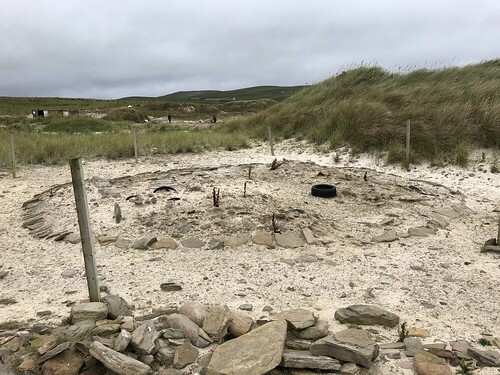 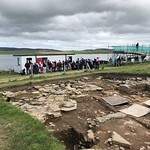 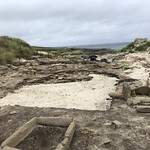 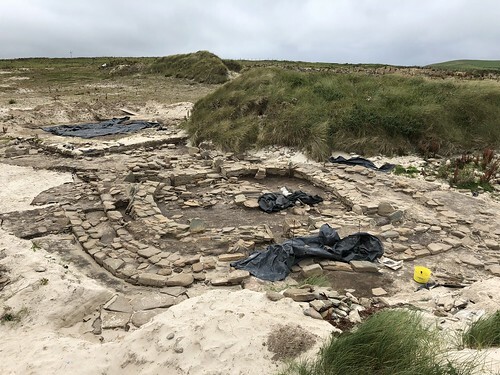 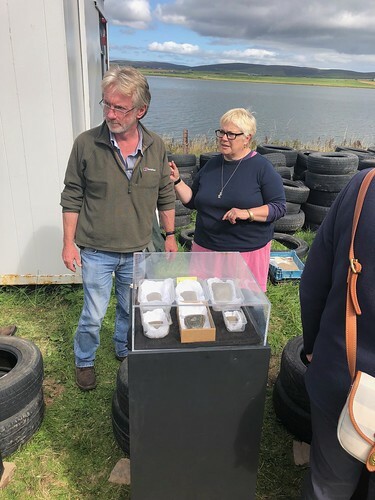 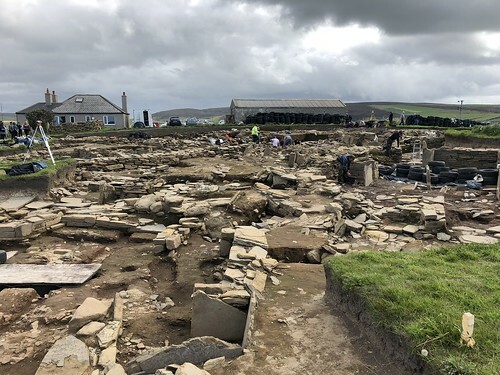 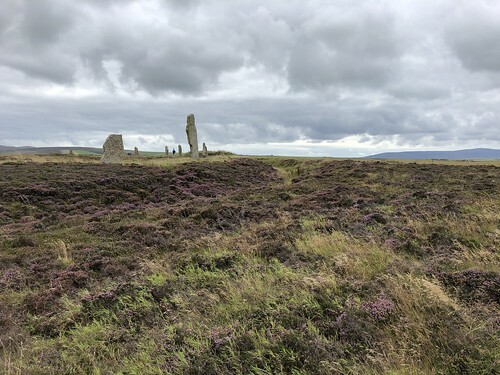 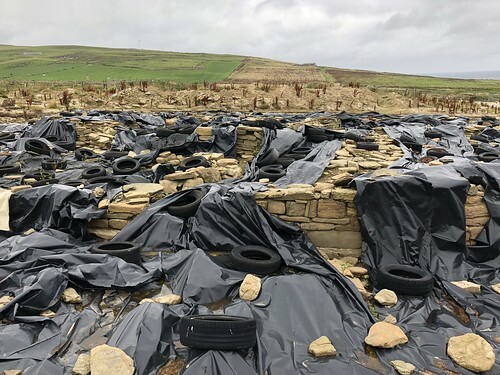 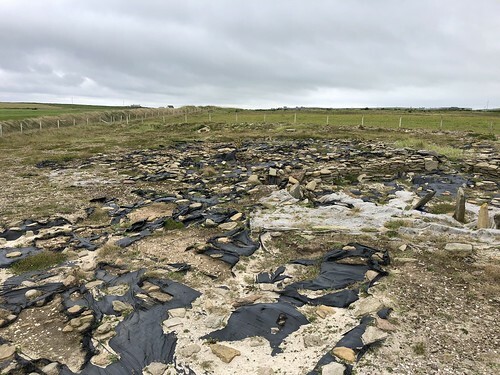 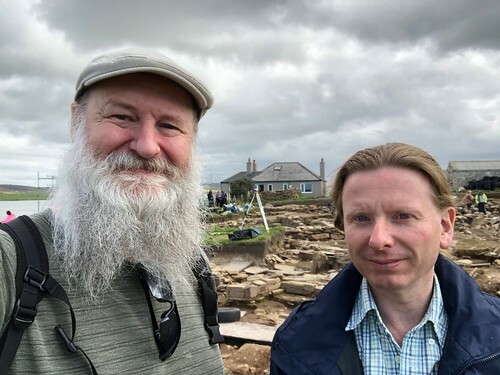 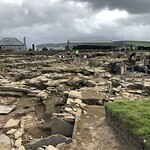 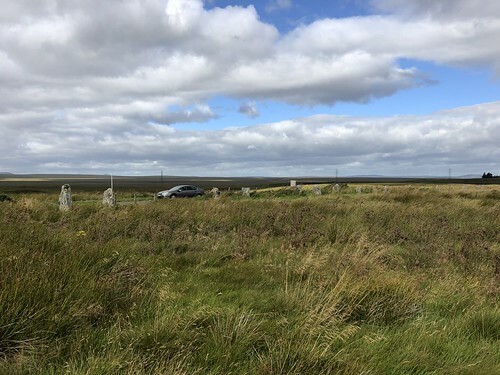 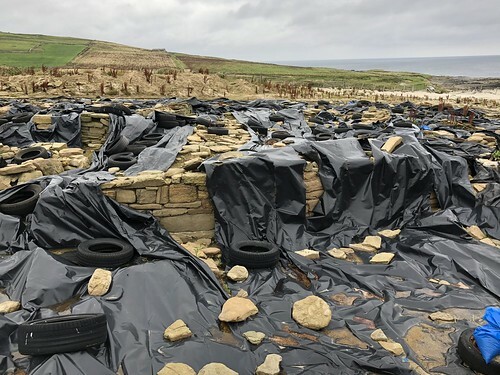 The first weekend was of course dedicated to revisiting the Ness of Brodgar archaeological site, to see the latest finds. 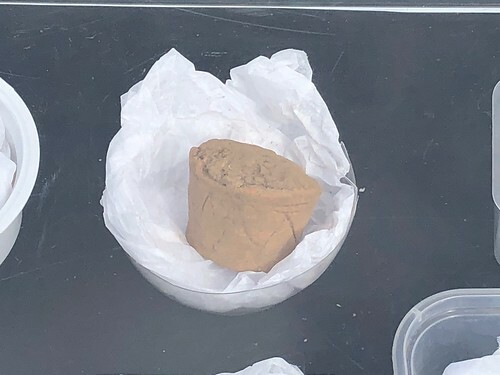 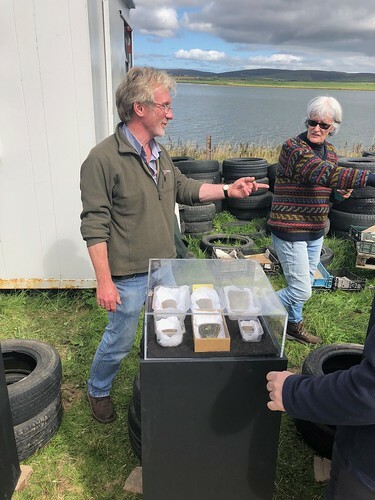 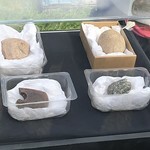 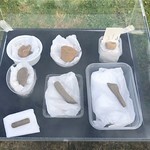 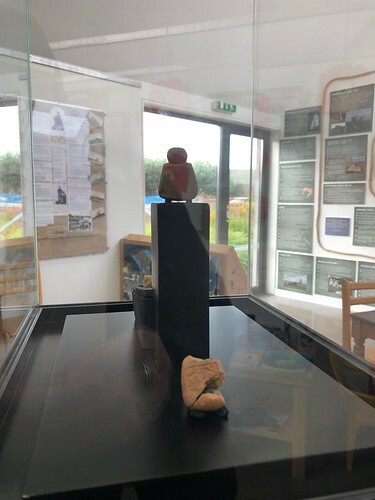 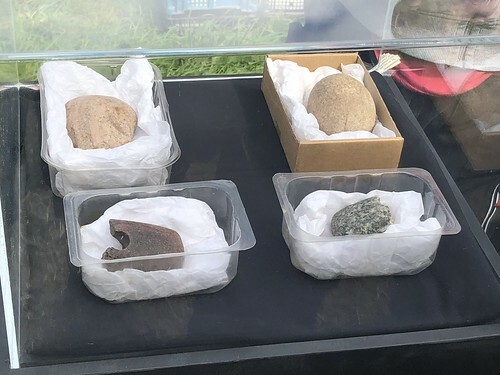 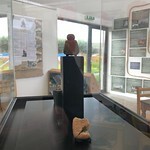 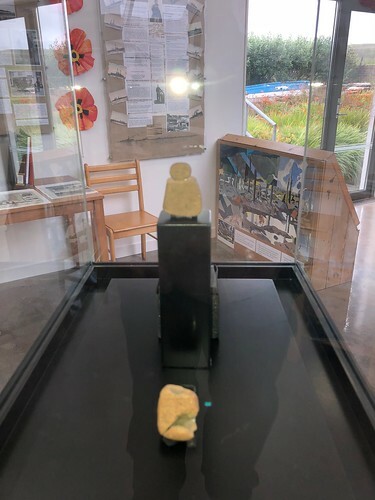 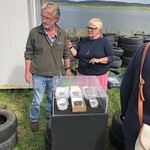 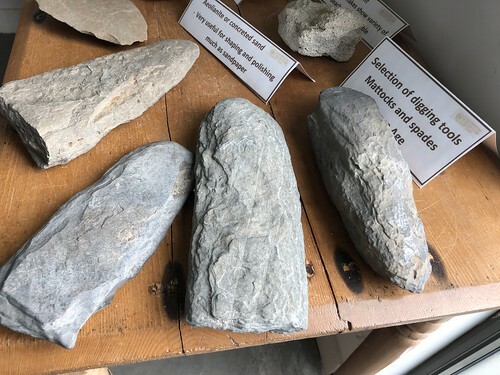 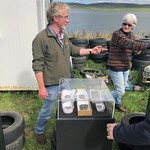 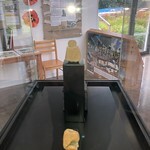 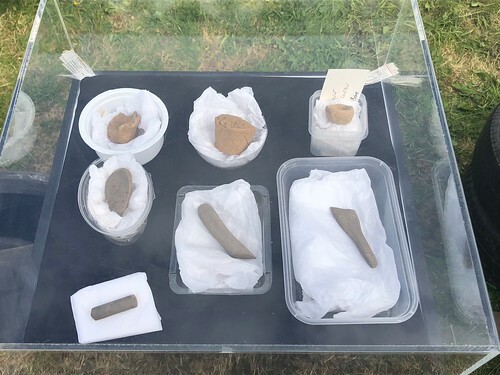 We were lucky to be here in time for the second of two ‘Open Days’ when the archaeologist, Nick Card, and his team were on hand to introduce all comers to the site, the finds, and a range of demonstration activities. 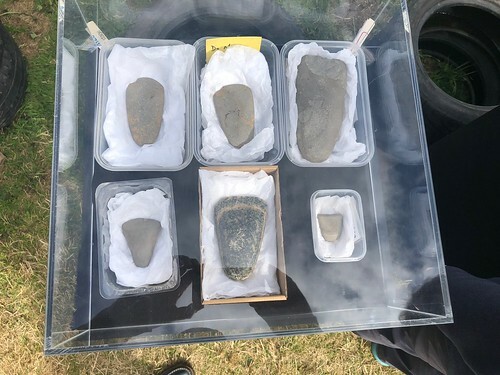 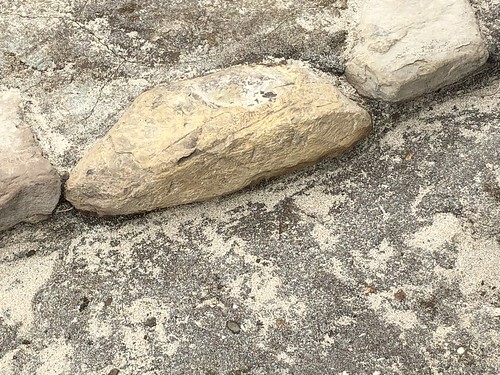 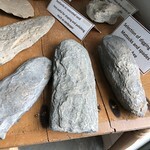 I headed straight for the latest finds, and exclaimed ‘There it is!’ as I saw the colourful polished stone axe that was found this summer, towards the beginning of this year’s dig. 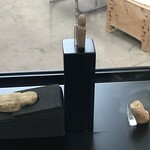 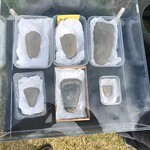 As I then looked up, I soon realised it was in fact Nick Card who was standing in front of me, explaining more about the recent finds, and how much he especially liked the smaller, plainer, but exquisitely carved polished axe (to its left in the picture above), which, he told me, was more likely ceremonial, or a gift, whereas the more colourful one showed enough signs of wear to likely have been in use, all those thousands of years ago. 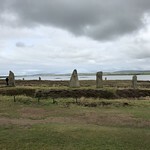 On the next day, we took the Heritage Scotland tour of the Ring of Brodgar, which was really interesting, and introduced us to a whole different way of looking at the ring: the henge (though without an outer bank it is arguably not like any other ‘henge’ monument) when cleared of vegetation, reveals quite light coloured stone, which would have made a clear whitish circle visible for miles around. 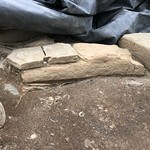 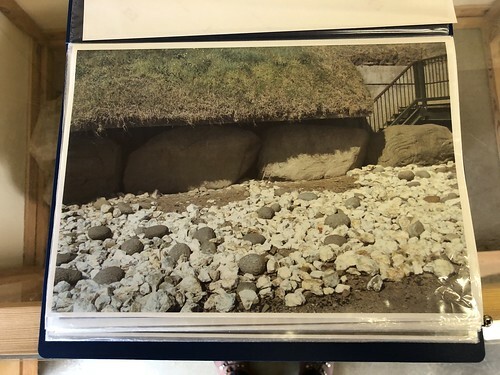 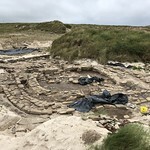 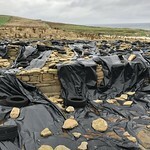 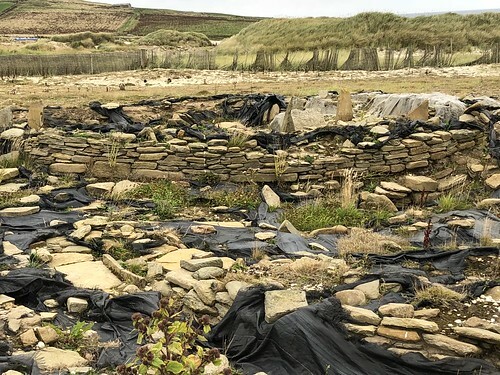 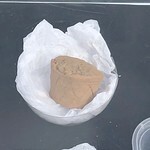 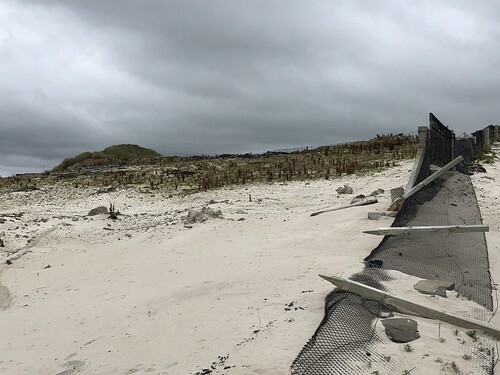 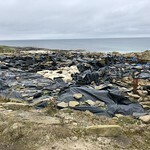 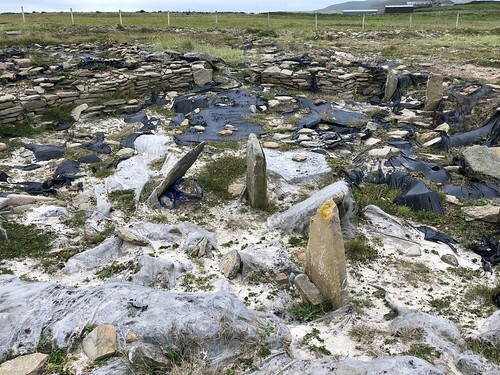 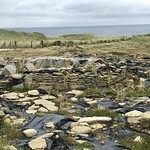 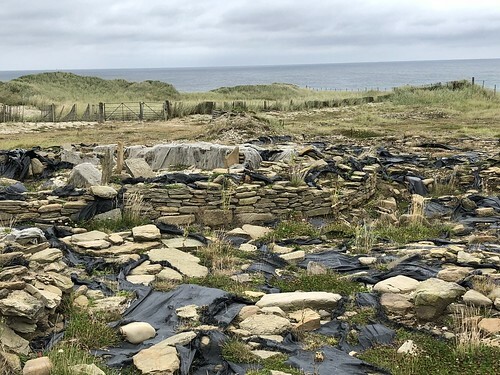 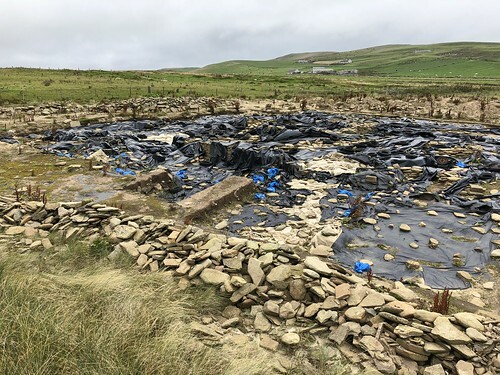 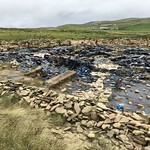 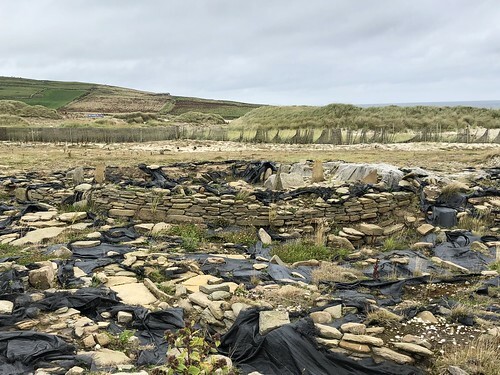 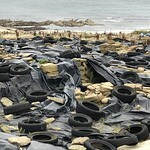 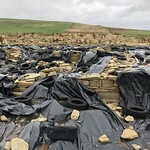 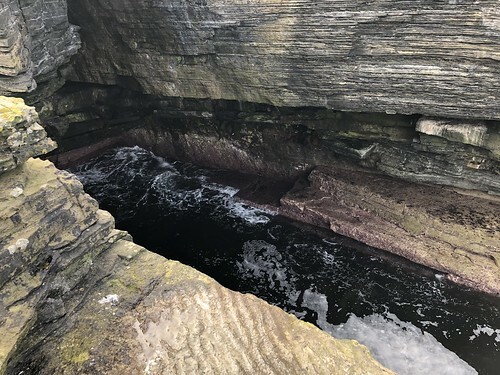 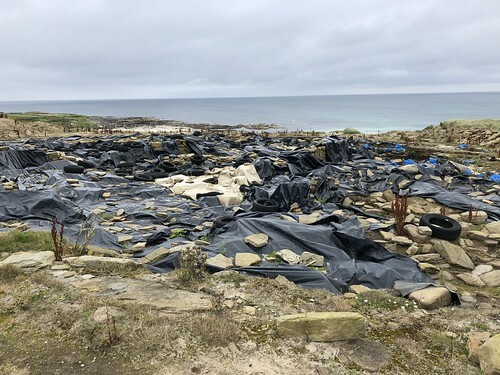 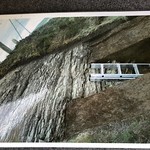 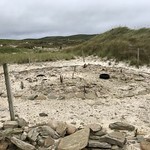 It had been dug out in ‘sausage shaped sections,’ possibly by different communities, before each section was finally knocked through to the others, to complete the ring. 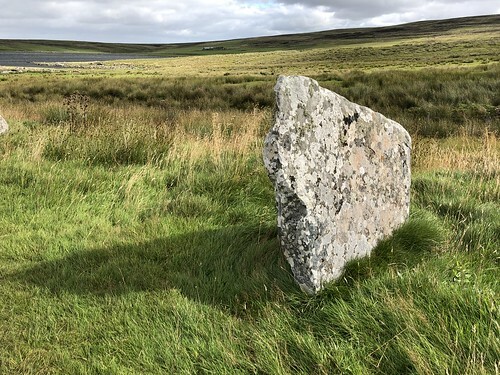 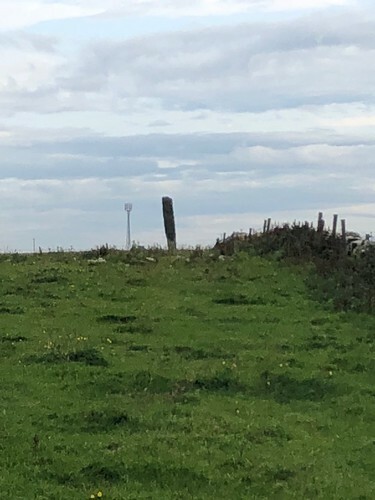 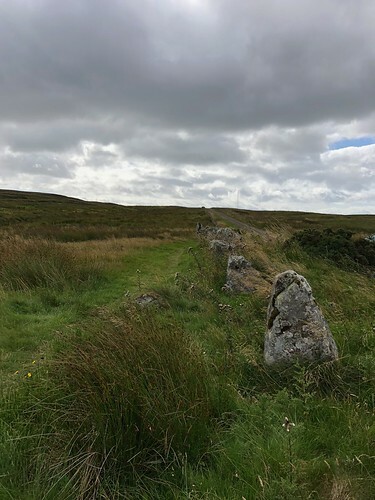 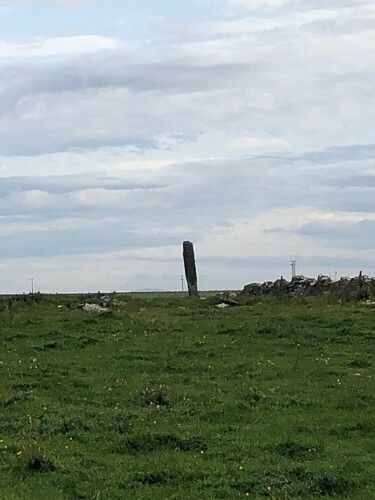 Moreover the stones seemed also to come from various parts of the island, erected upon the ring nearest to their origin, perhaps representing, or erected by the same communities who had dug that section of the ring. 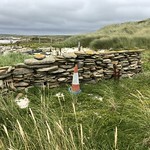 The monument becomes more like a community space, perhaps for meetings (where marriages, for example, could be arranged) or some kind of parliament, or perhaps where markers of special events in that community could be laid, from time to time. 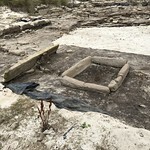 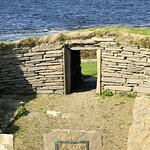 In this way, the ring becomes a process, rather than a finished monument with a purpose. 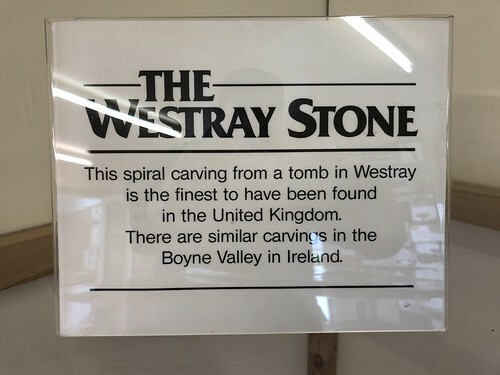 All fascinating stuff. 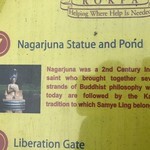 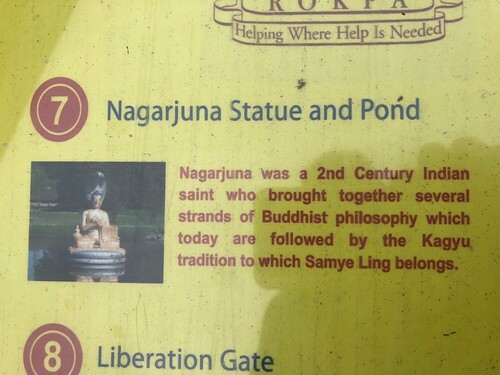 But of course no-one really knows…. 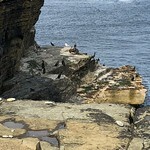 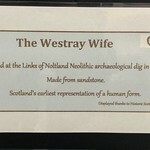 Our first big excursion from the ‘mainland’ of Orkney was to the Westrays. 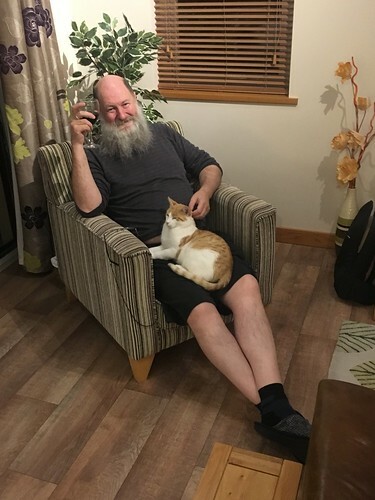 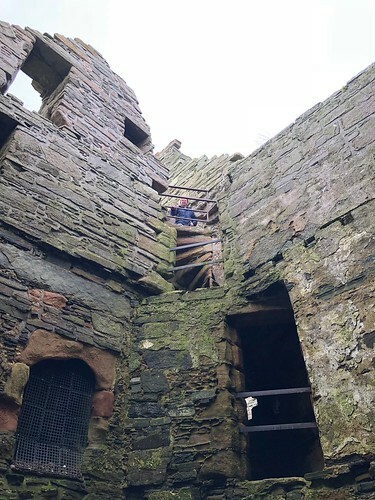 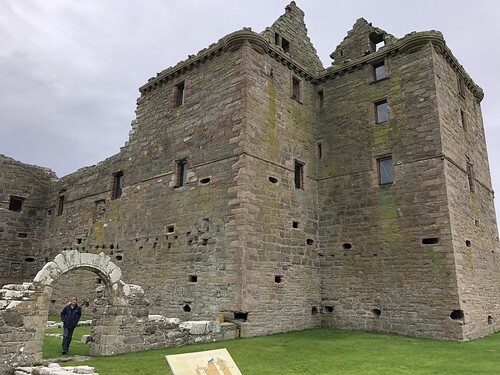 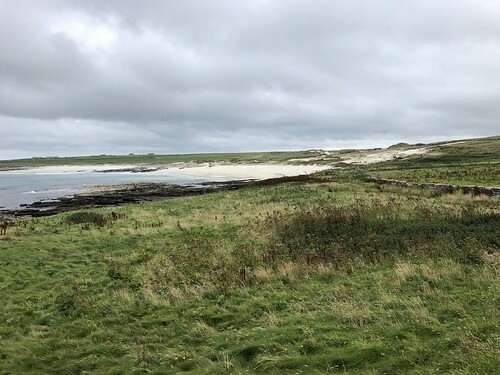 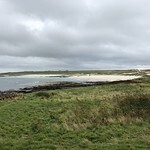 We took the car ferry from Kirkwall to Rapness, and drove slowly up to Pierowall – the only town on Westray – where we had a room in a lovely B&B for the night: No.1 Broughton. 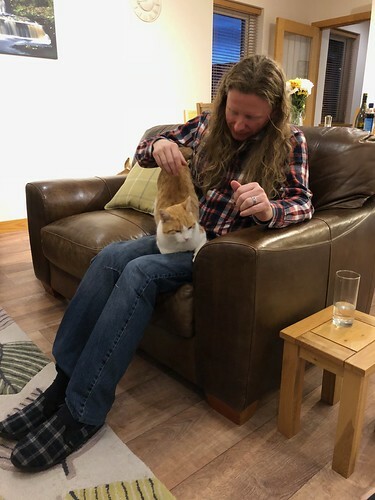 Our host cooked us a very nice dinner. 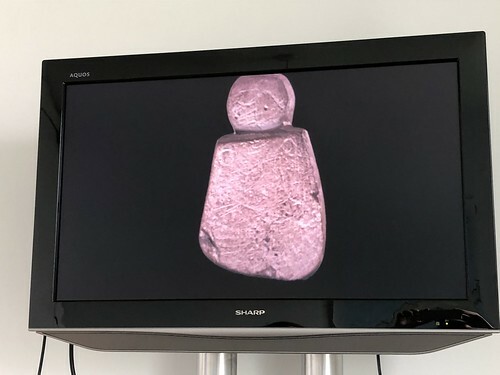 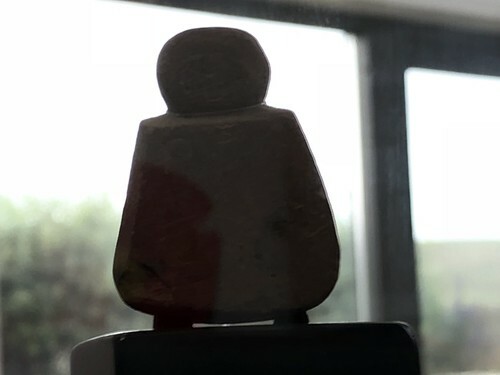 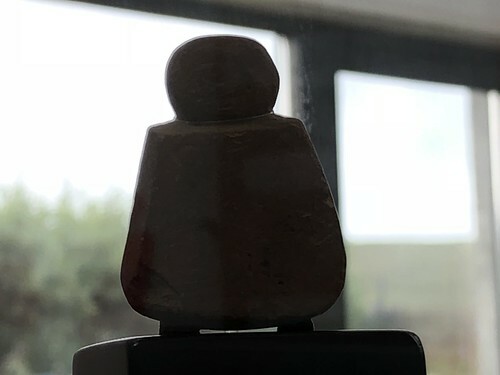 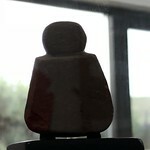 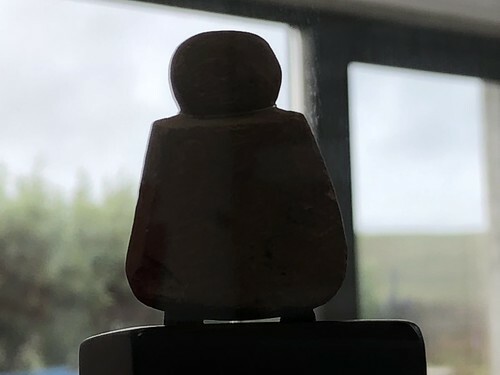 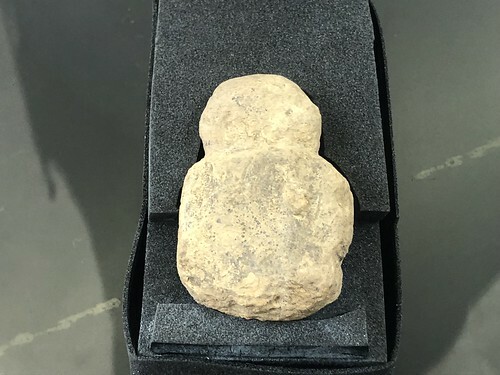 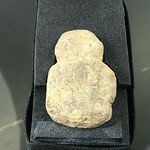 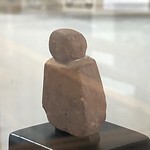 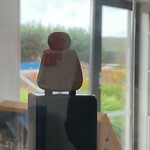 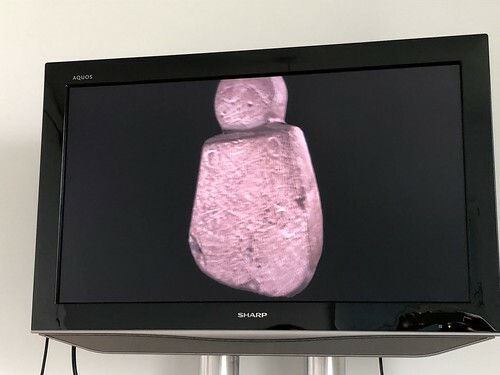 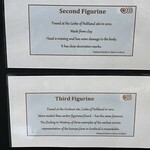 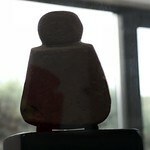 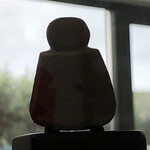 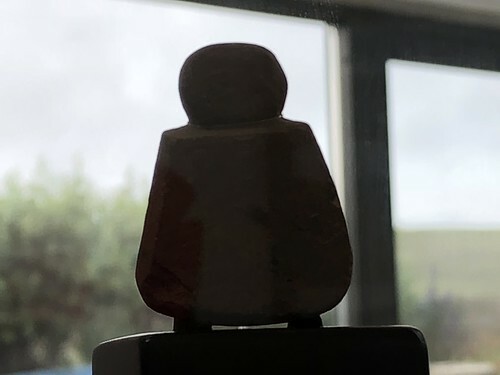 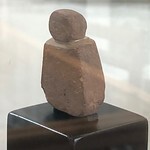 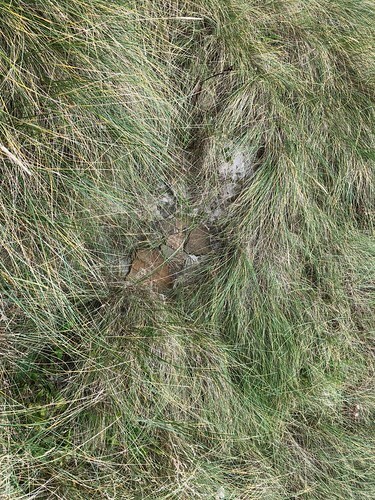 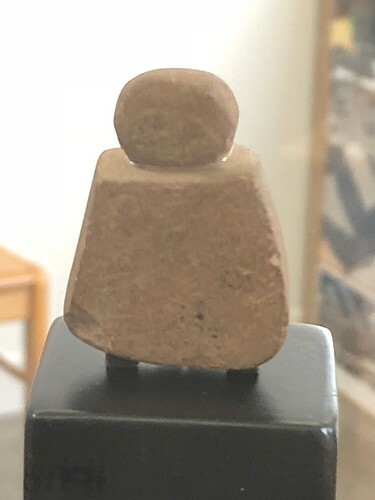 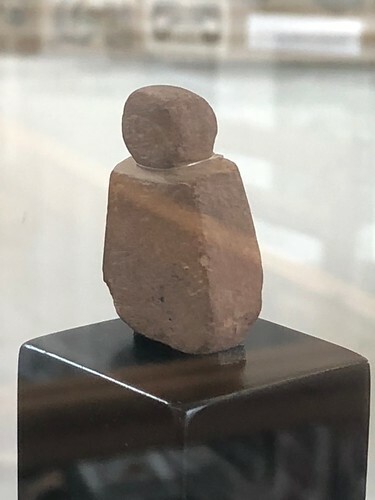 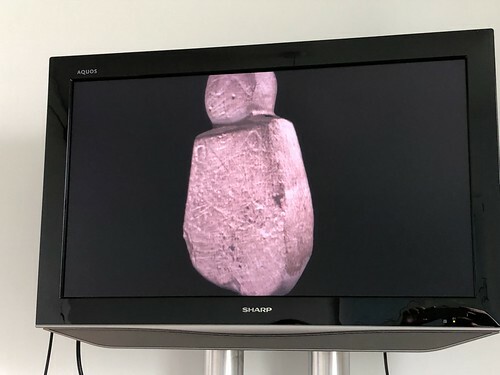 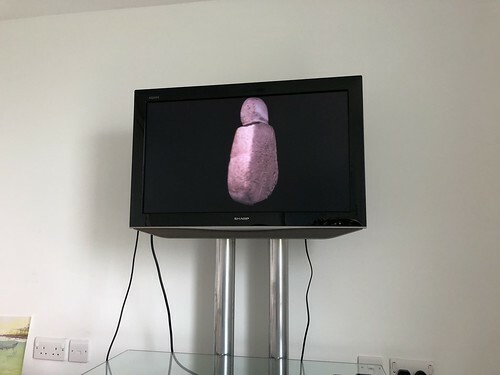 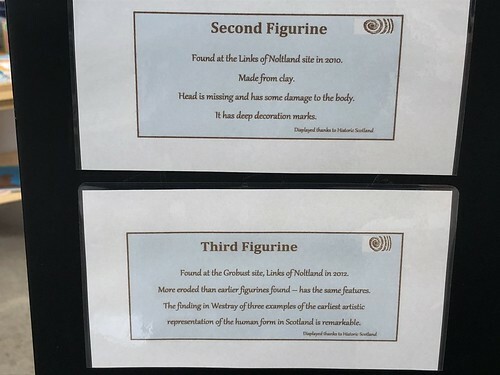 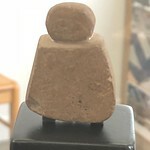 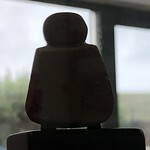 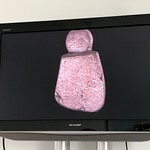 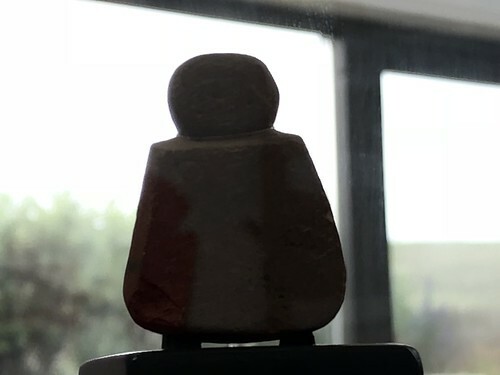 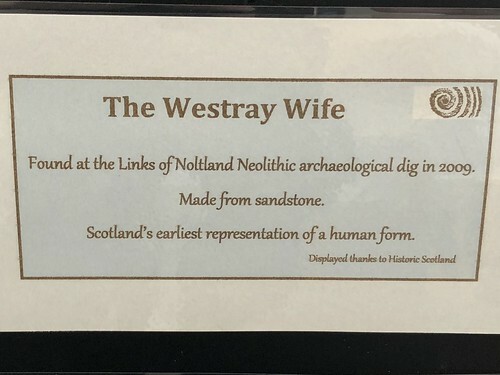 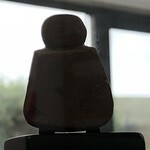 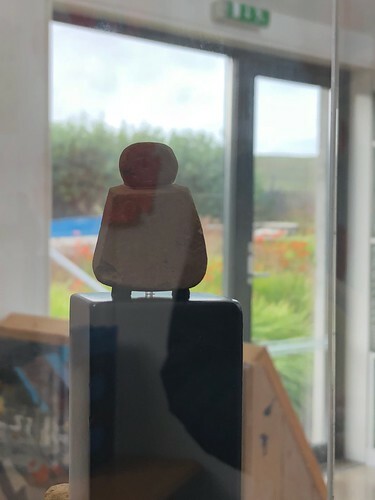 and the Westray Wife, one of three figurines – the only representations of humans found in any Neolithic dig in Orkney, unearthed at the Noltland Links neolithic site, near to Grobust beach, in 2009. 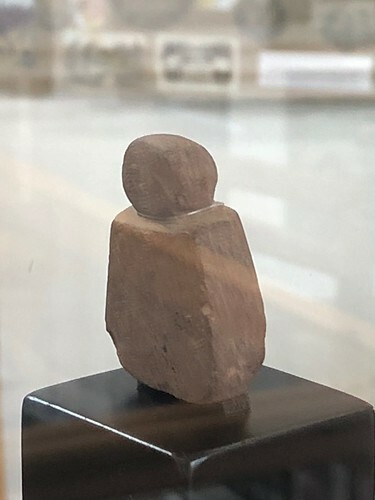 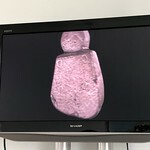 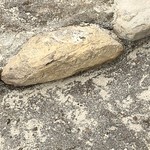 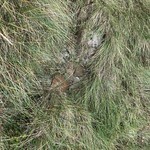 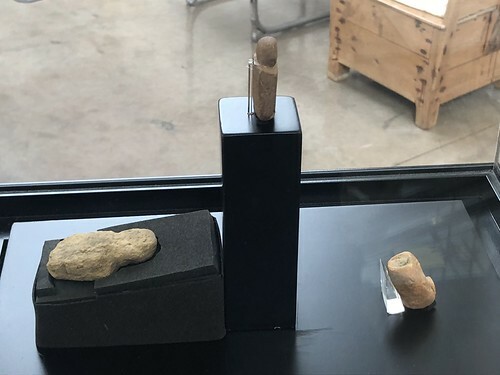 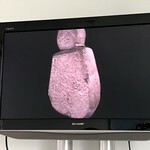 Here – faintly – one can see the ‘eye-brow’ motif on the face of a human figurine for the first time. 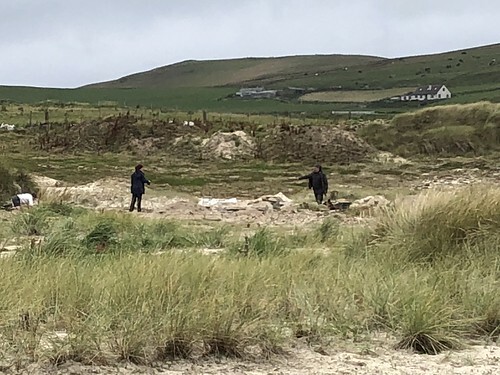 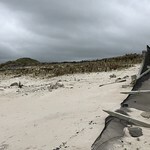 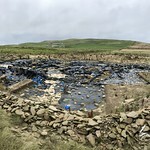 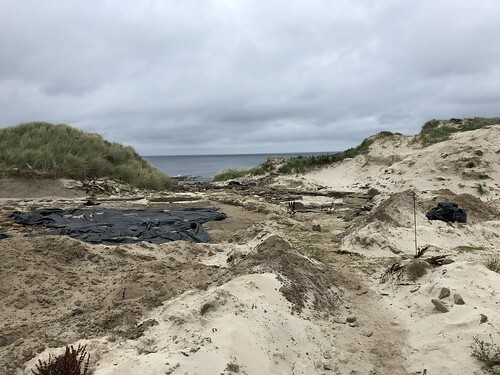 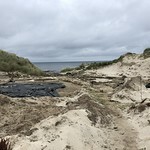 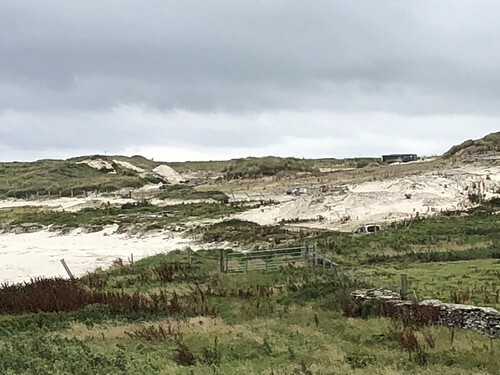 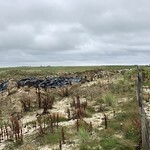 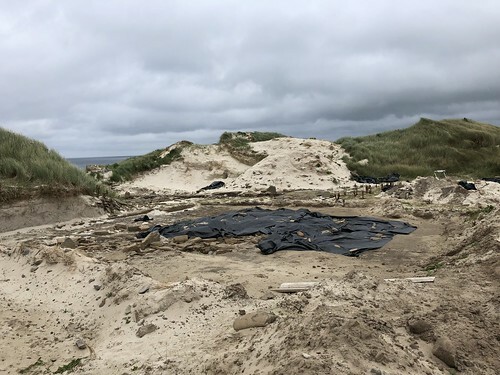 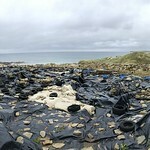 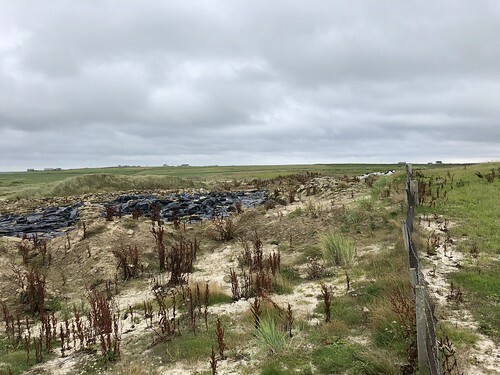 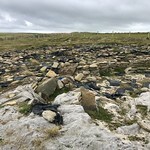 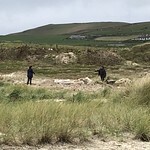 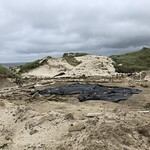 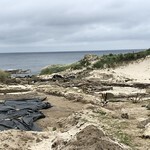 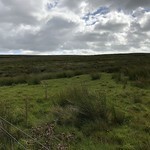 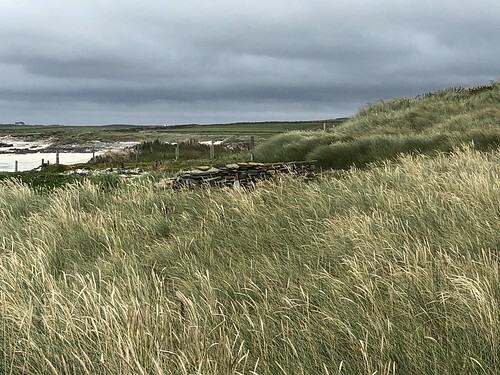 This site was a second visit, where we were fortunate enough to be given a free – if quick – guided tour to the site, where there are a wealth of both neolithic and bronze age buildings, being gradually uncovered by wind and rain, as the sand dunes are gradually denuded in a shift in weather patterns that first revealed the archeaology beneath in the early 2000s. 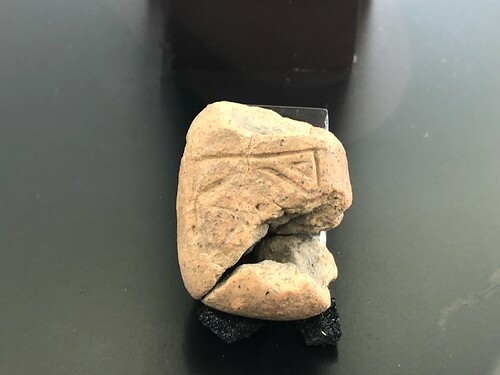 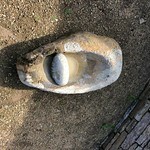 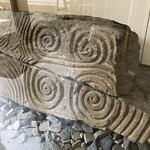 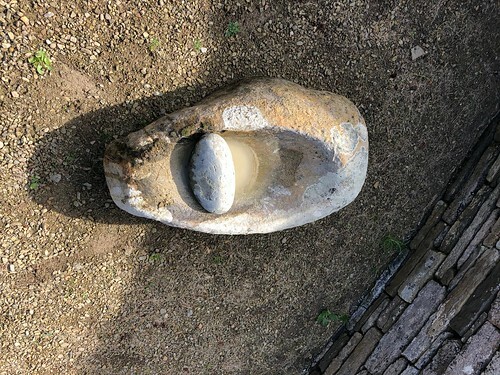 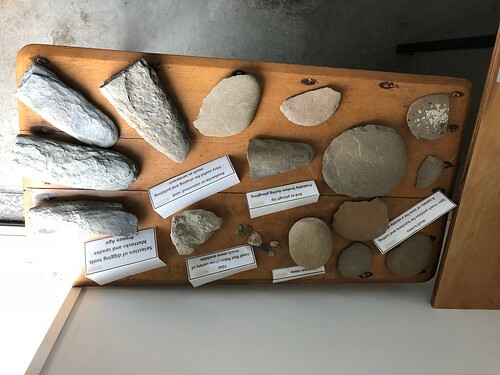 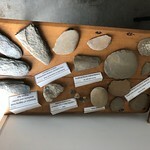 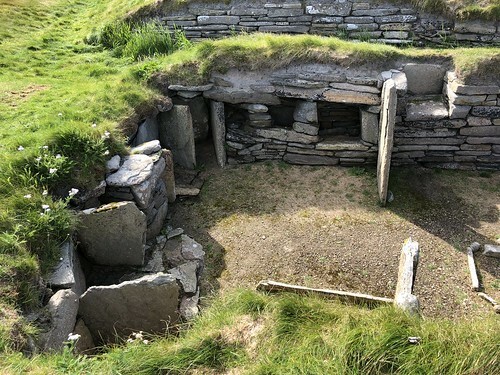 There are decorated stones here, paved walkways between the houses, and thousands of finds awaiting dating and -eventually – display. 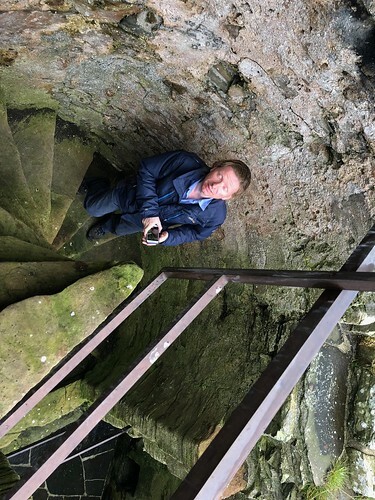 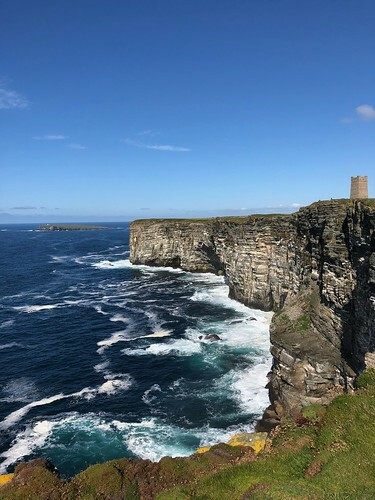 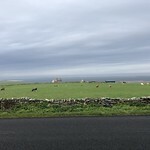 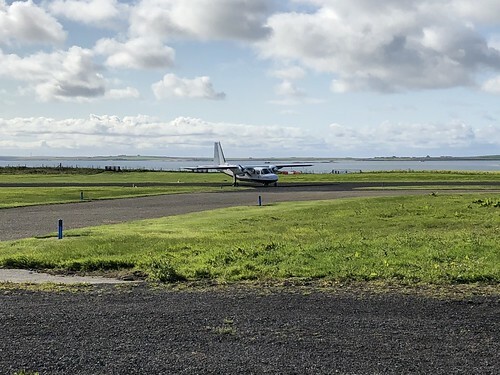 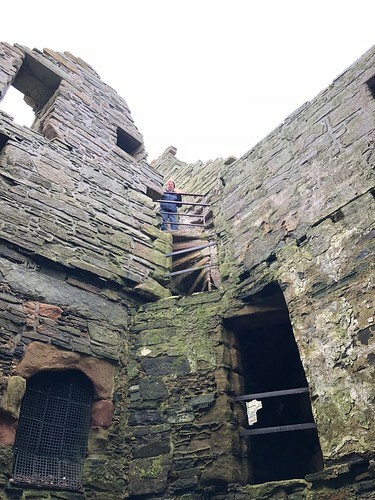 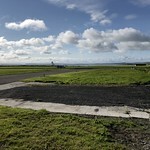 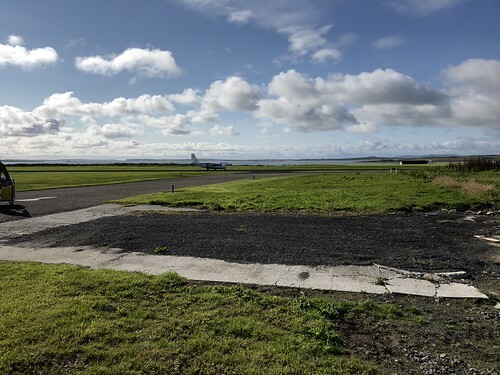 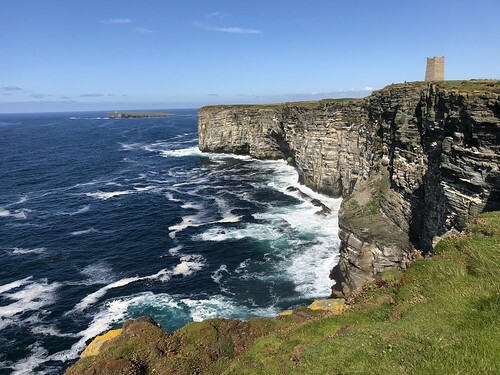 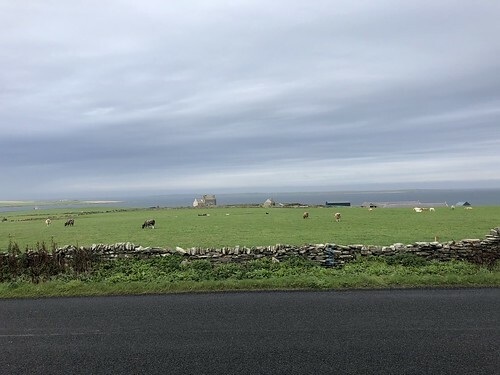 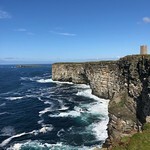 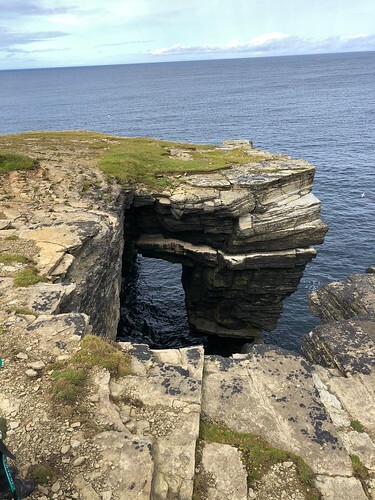 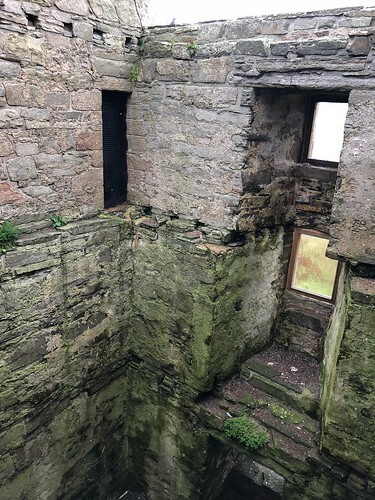 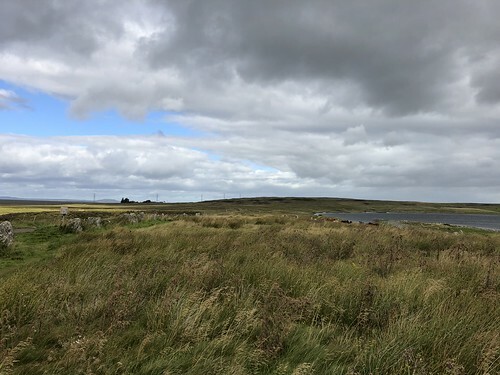 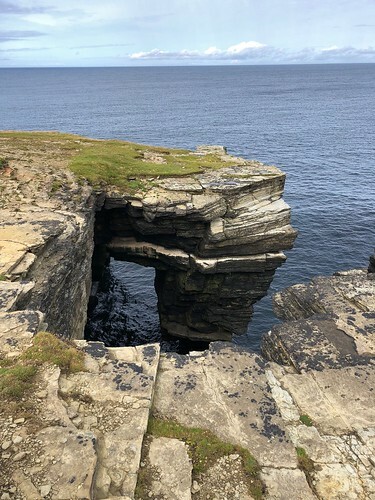 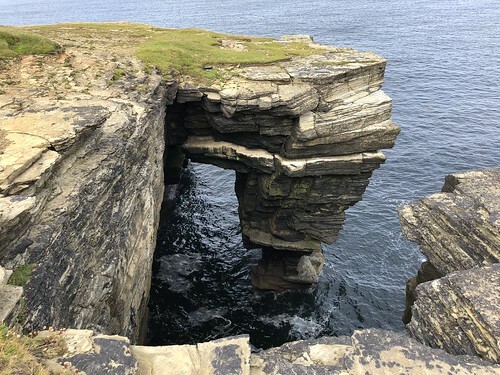 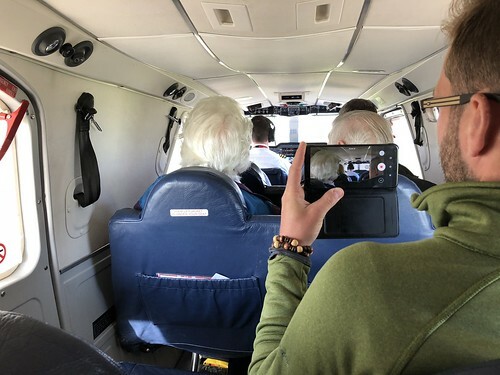 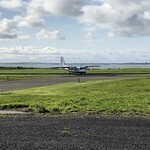 The following morning we took the shortest scheduled flight in the UK – the 2 minute journey to Papa Westray – known as Papay by the locals. 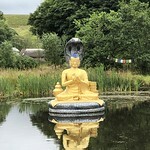 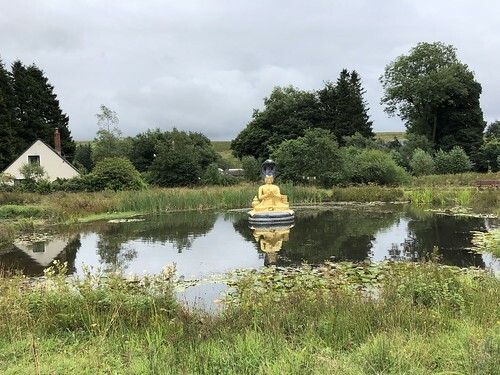 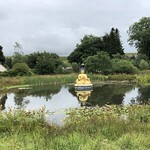 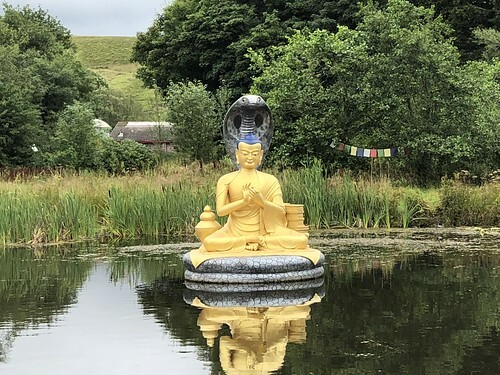 Here we stayed at the Beltane House Hostel – a community run affair built recently with good funding and very comfortable. 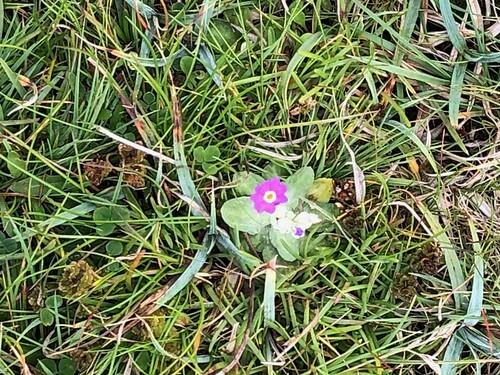 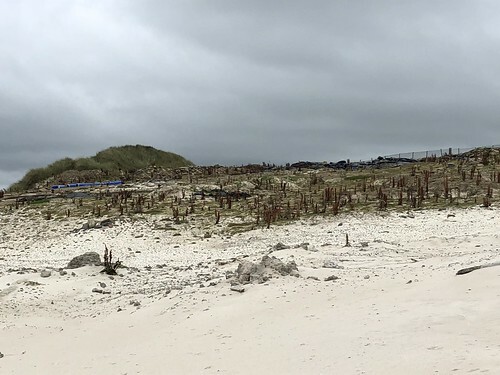 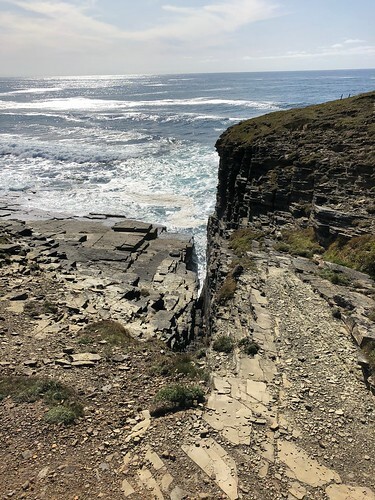 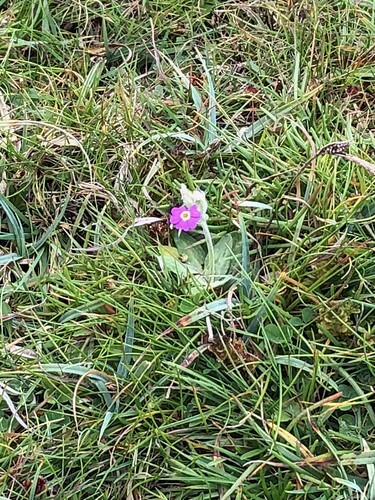 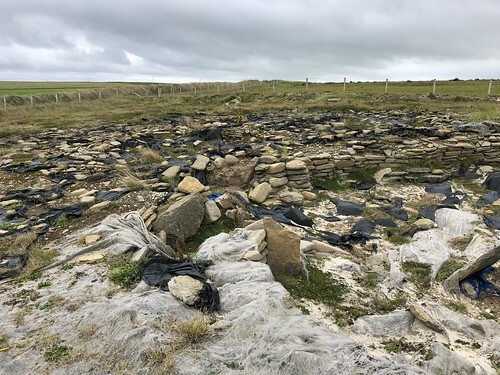 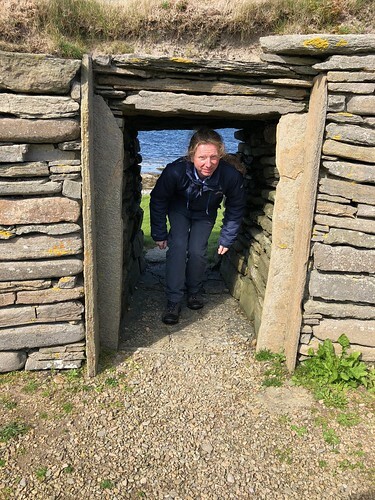 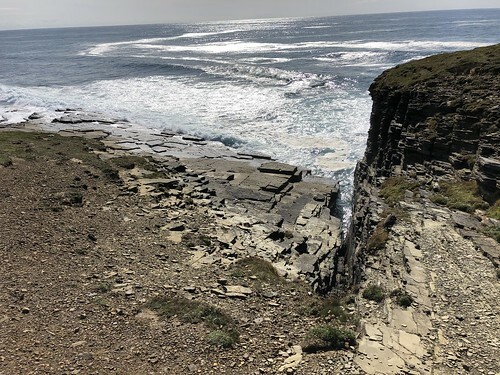 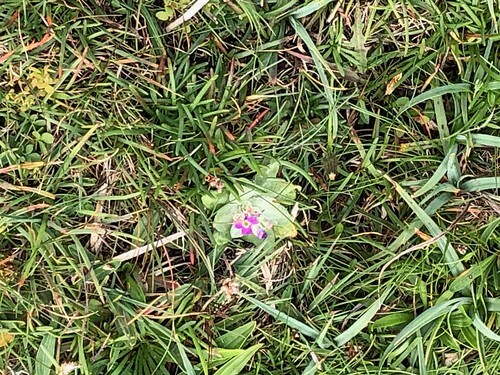 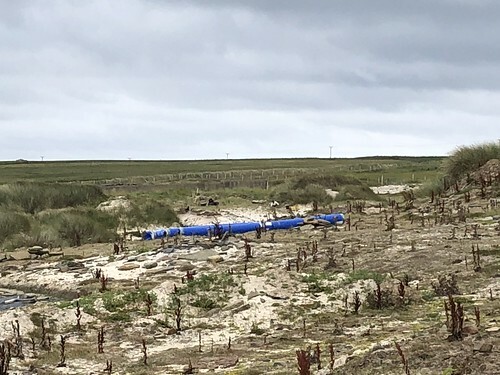 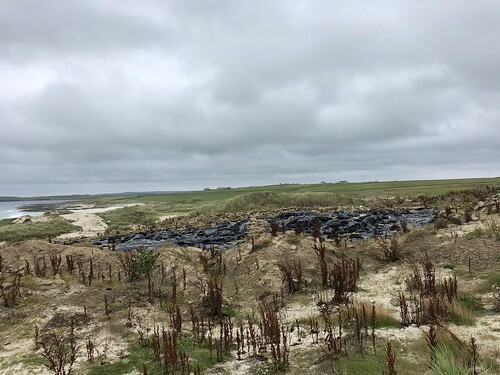 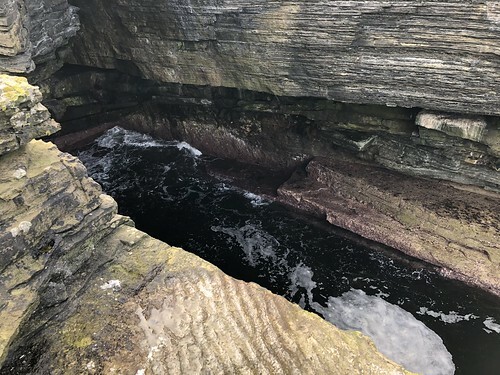 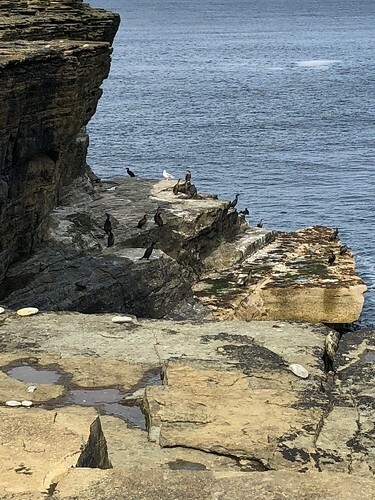 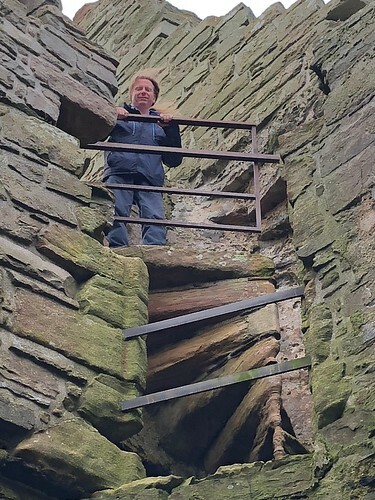 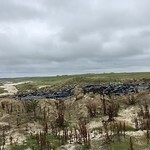 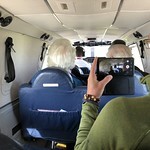 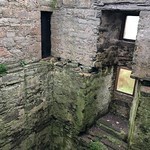 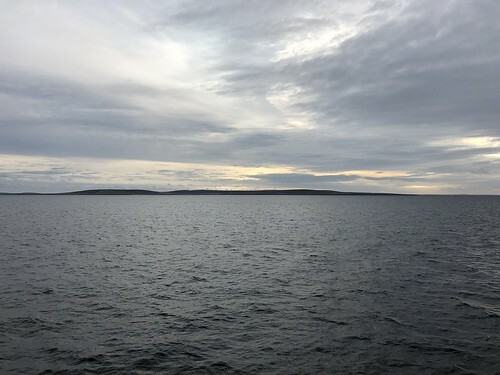 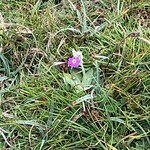 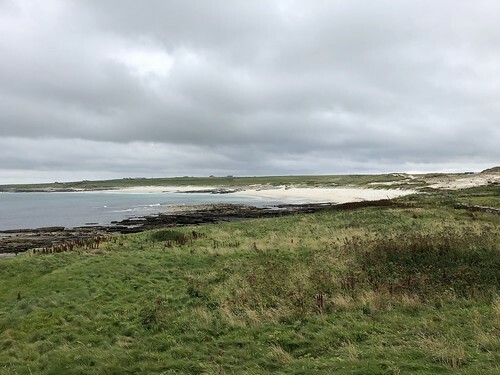 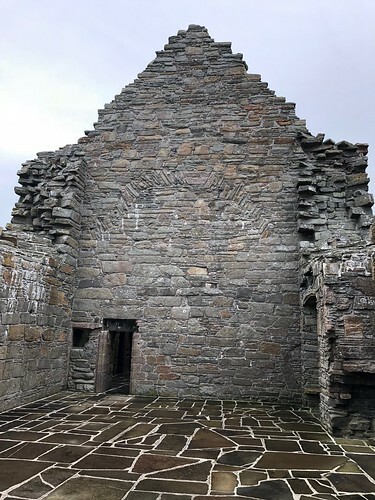 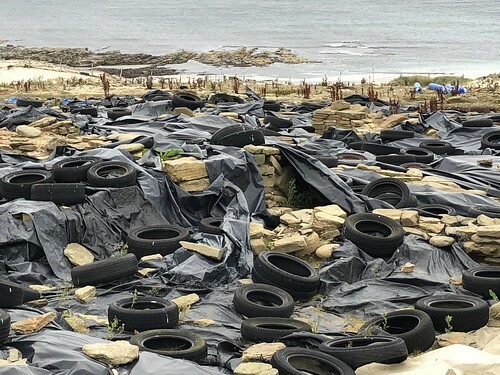 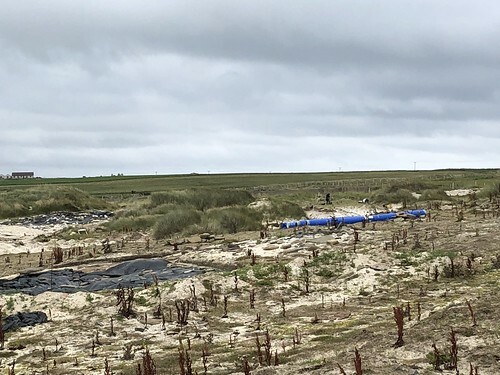 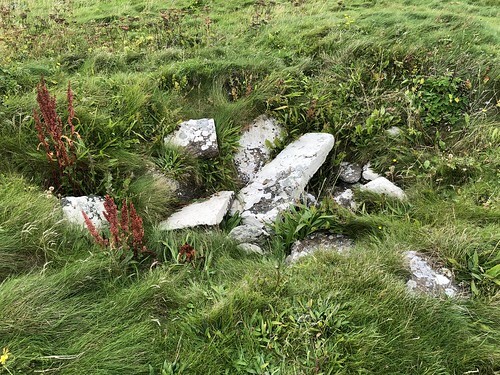 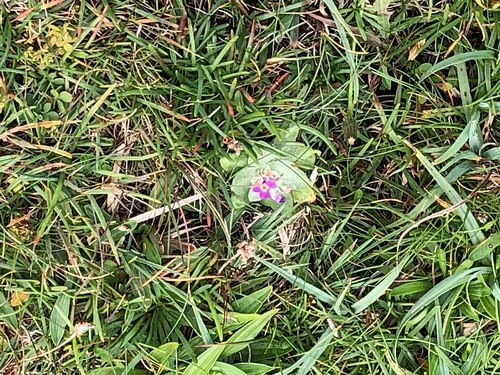 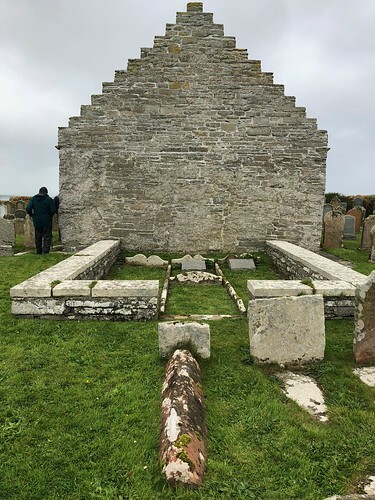 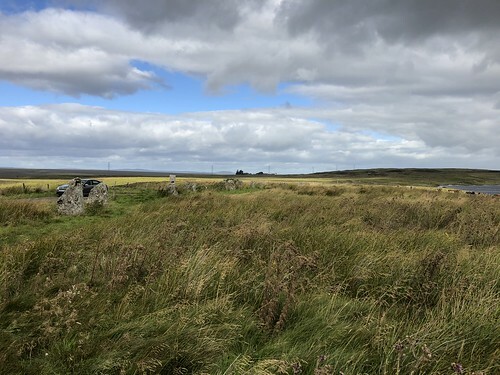 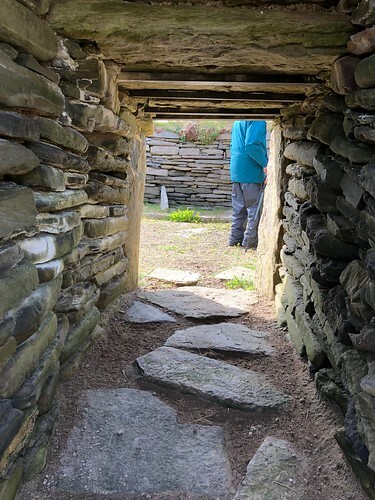 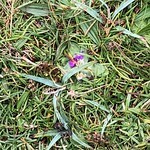 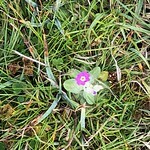 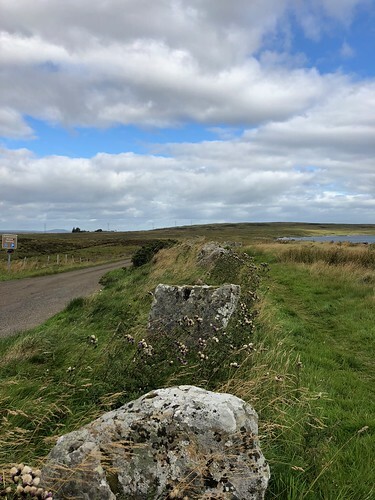 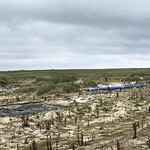 On Papay there are again two principal sites to visit, the first of which we saw on the first day as part of the all day tour with the Papay Ranger, and second on a special trip he took us on, by boat, on the following morning. 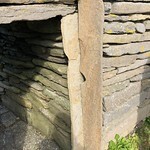 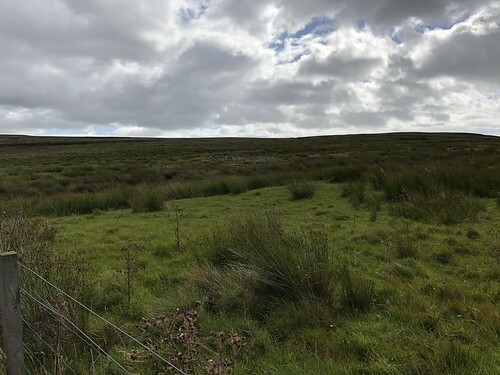 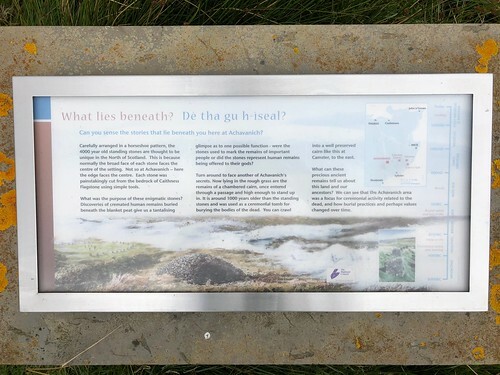 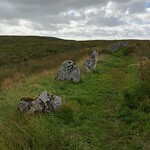 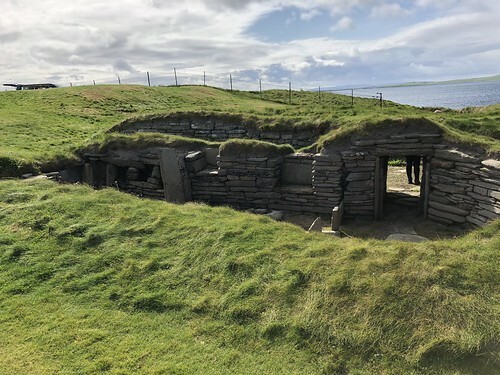 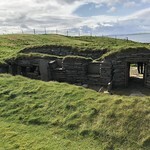 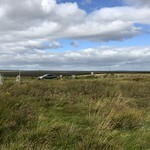 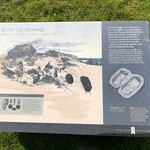 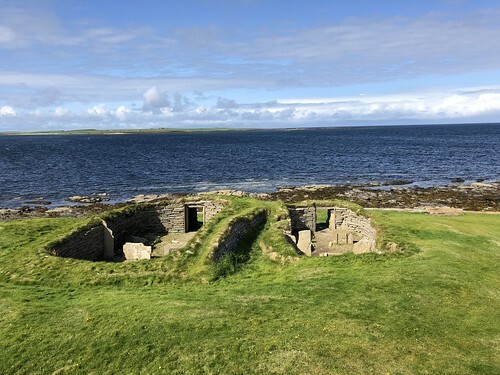 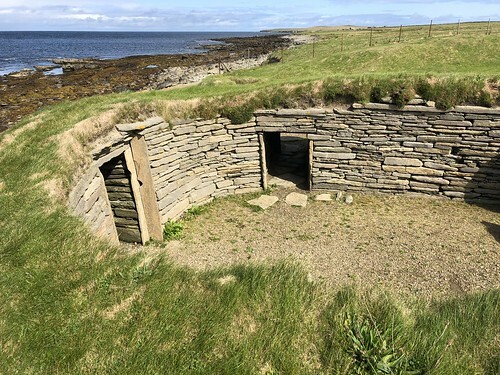 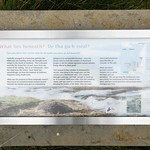 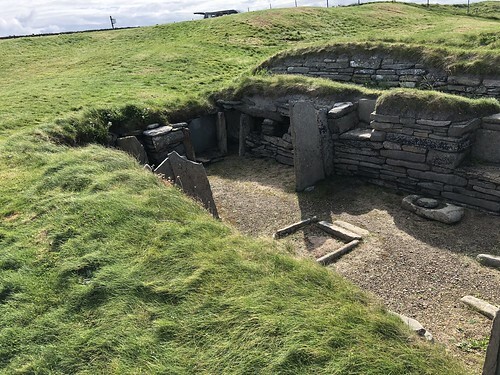 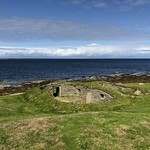 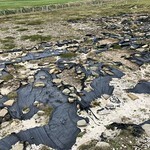 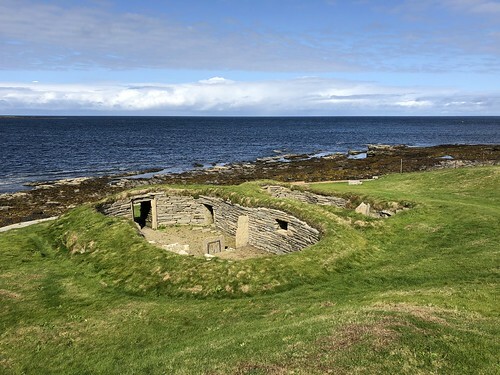 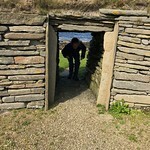 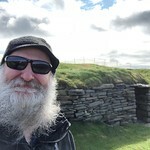 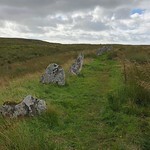 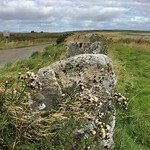 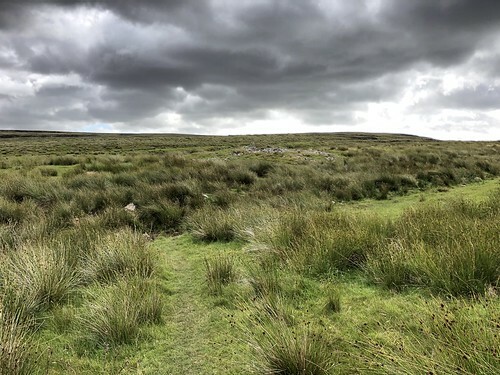 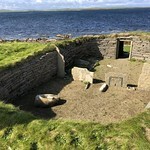 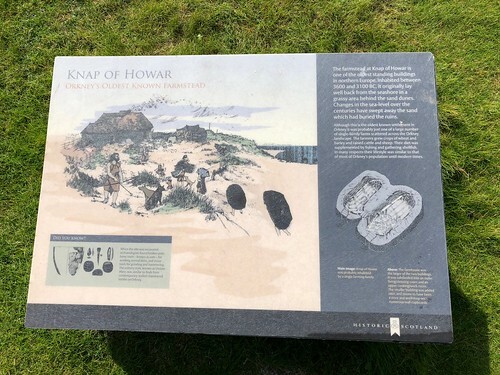 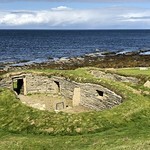 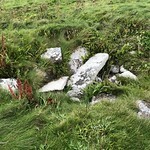 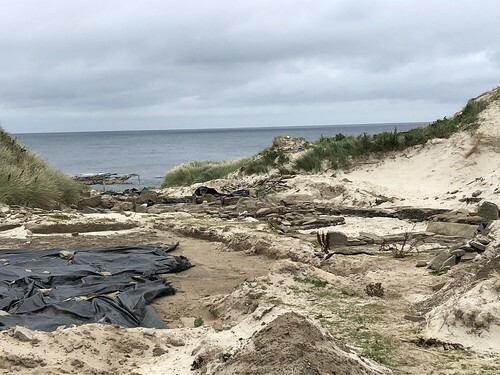 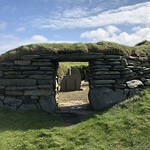 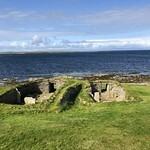 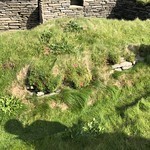 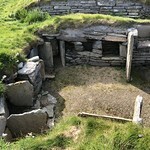 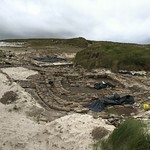 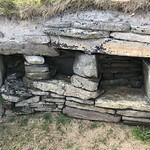 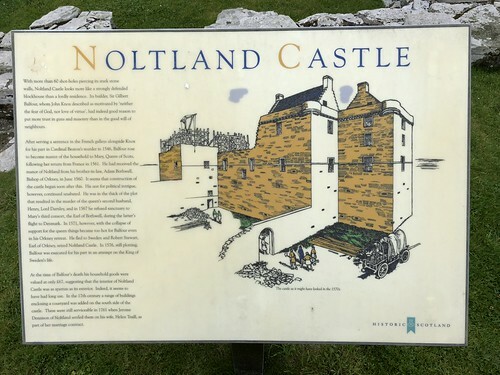 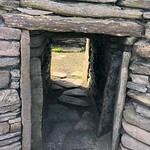 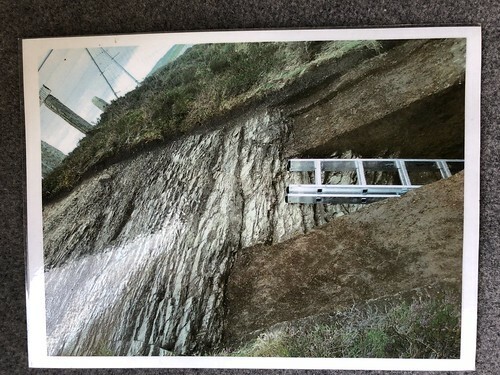 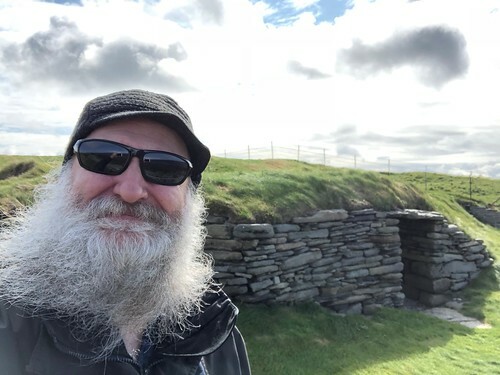 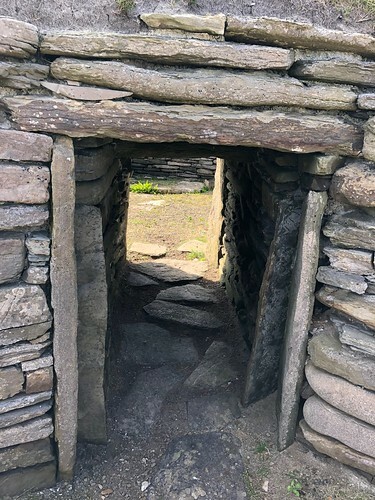 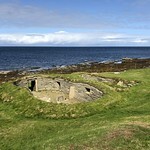 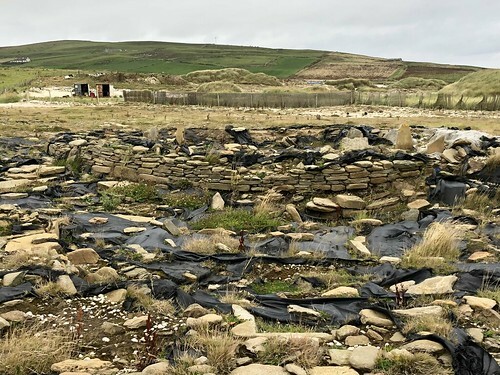 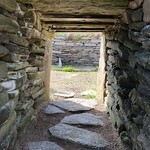 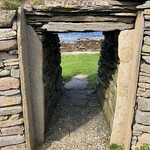 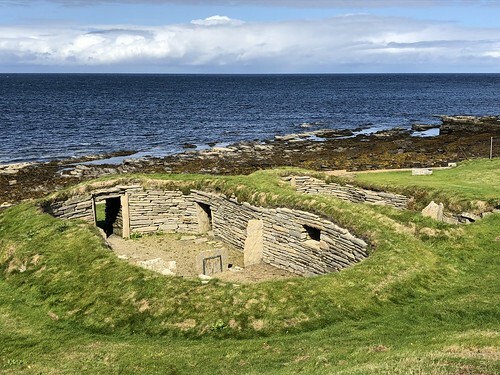 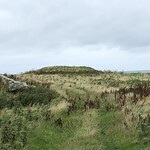 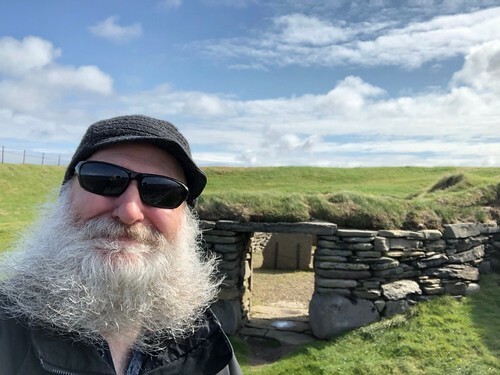 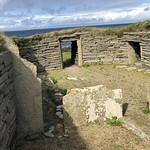 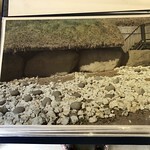 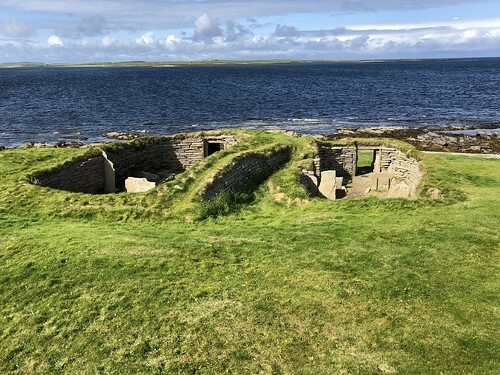 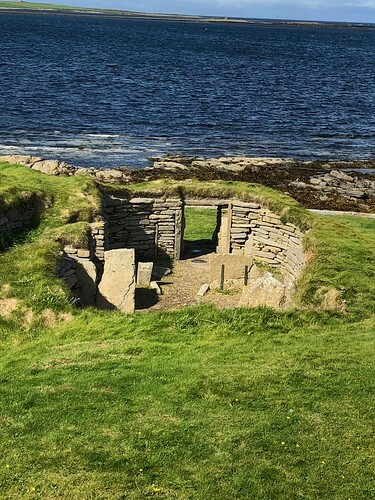 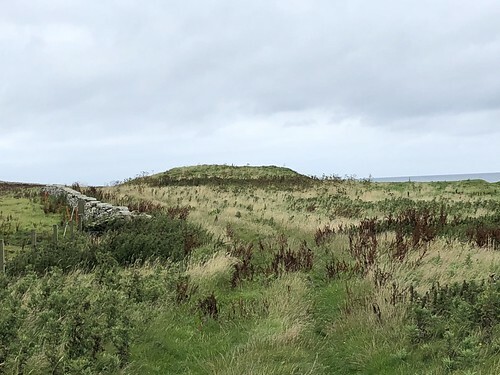 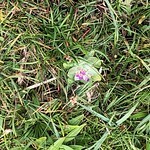 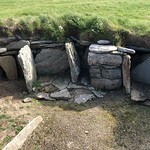 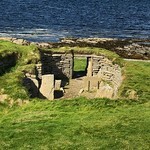 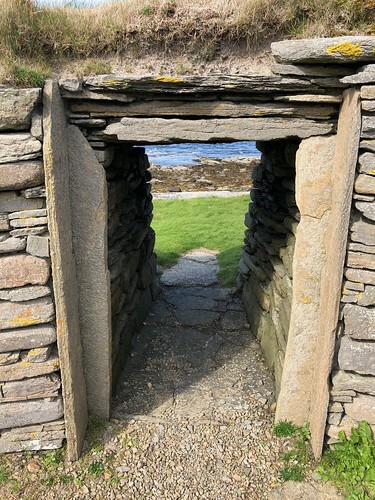 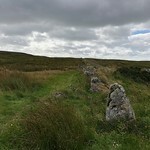 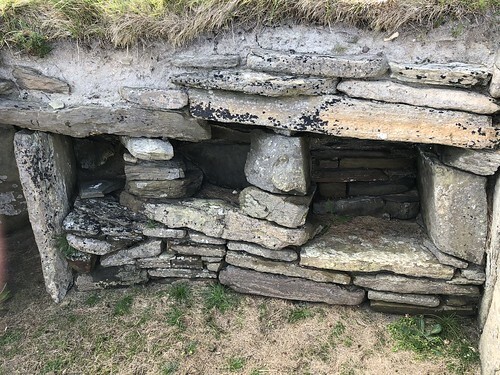 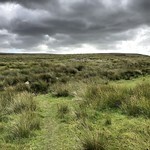 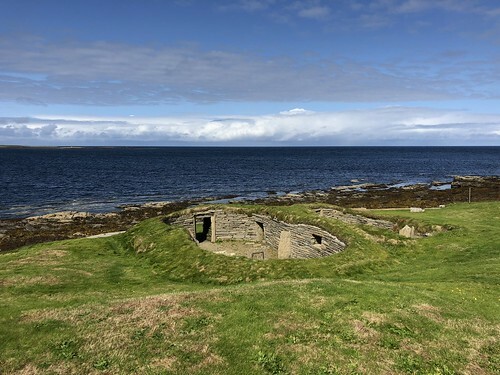 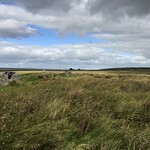 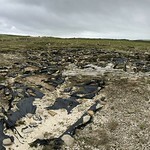 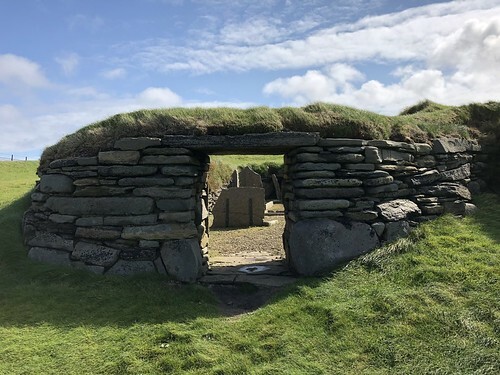 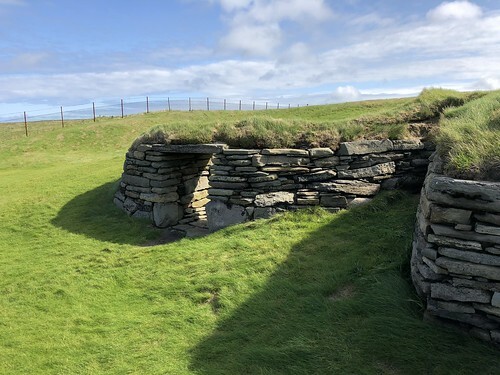 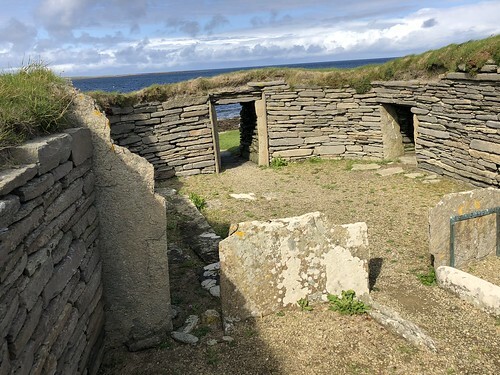 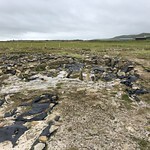 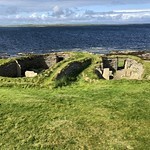 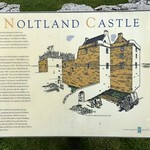 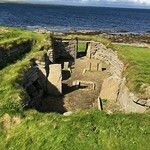 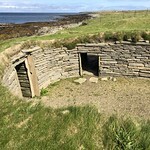 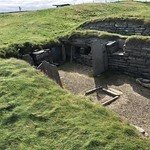 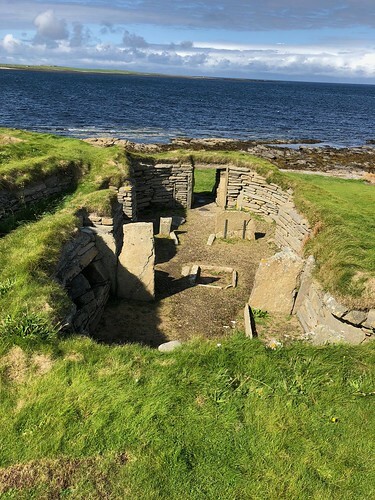 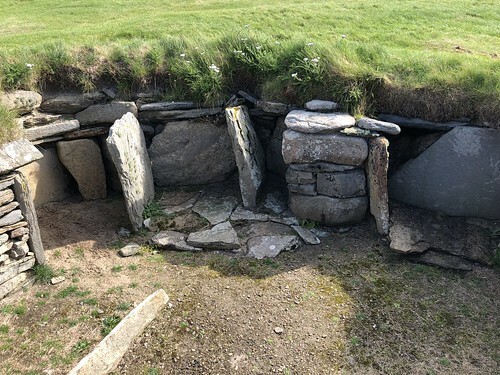 The first notable site is the Knap of Howar, a Neolithic dwelling similar to, but slightly older than Scara Brae, and was inhabited between 3600BC and 3100BC. 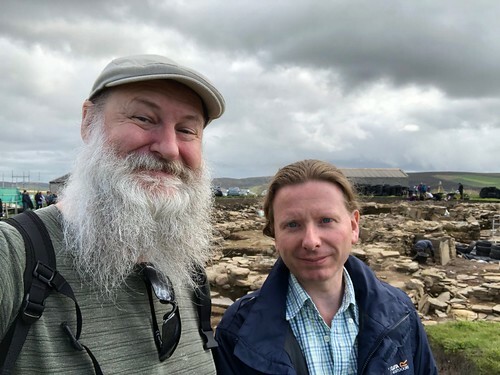 [For comparison, the Great Pyramid of Giza was completed c.2560BC, and the henge at Stonehenge – the first part of that monument, was constructed in 3100BC, the final site completed about 1600BC .] 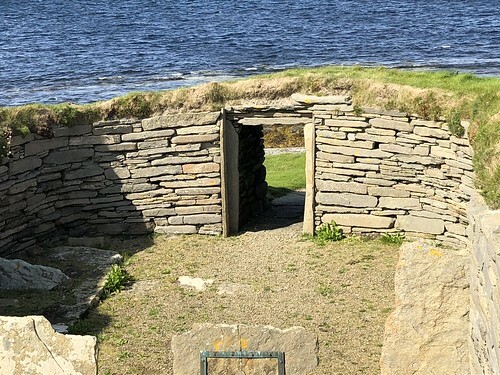 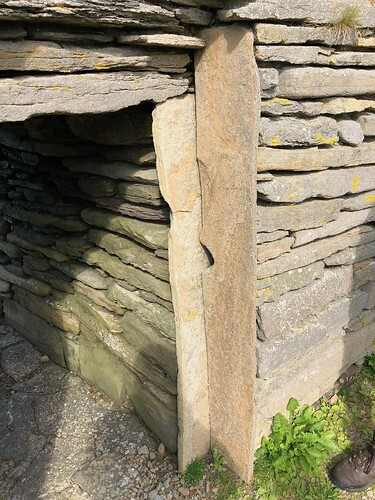 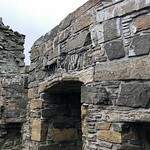 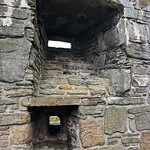 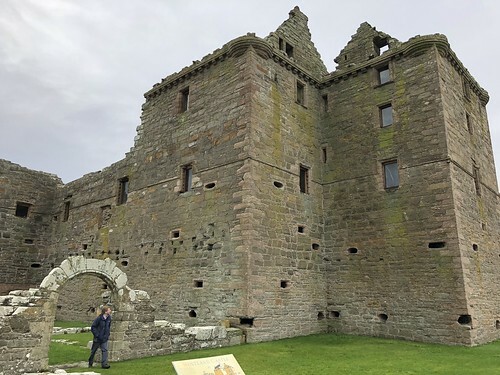 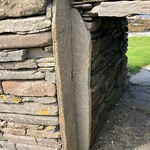 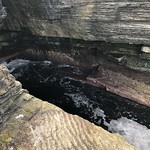 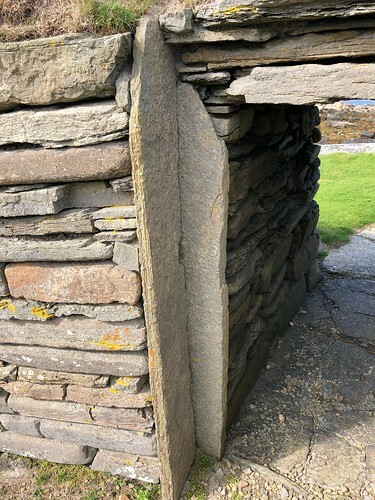 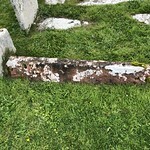 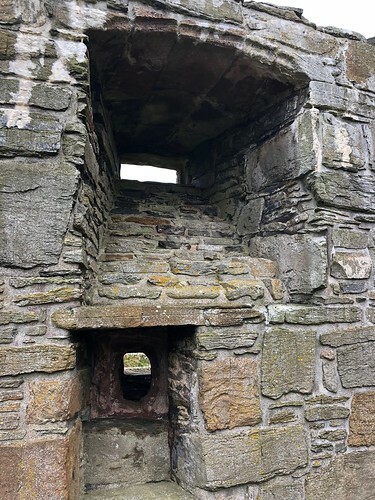 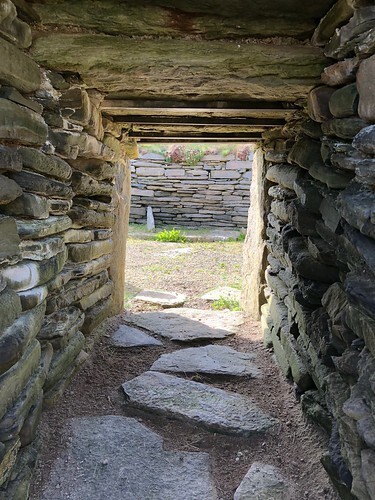 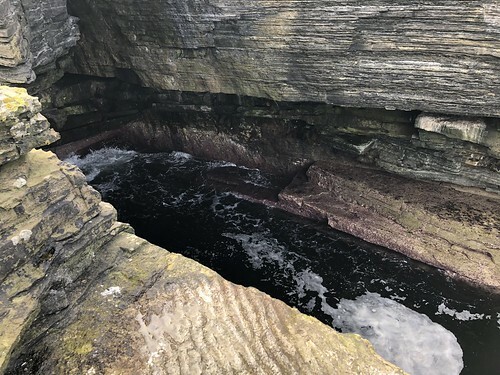 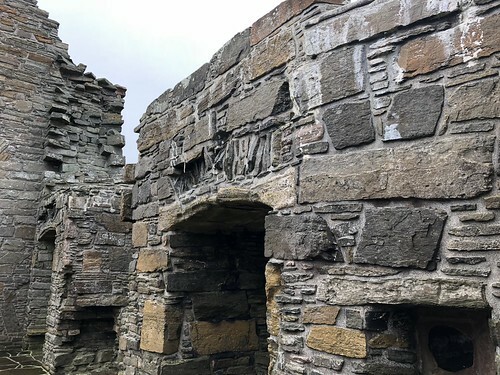 The Knap of Howar is very impressive, showing very fine masonry, the distinctive ‘dresser’ style internal furniture, and walls (now surrounded by earth to help keep them up) several feet thick and high. 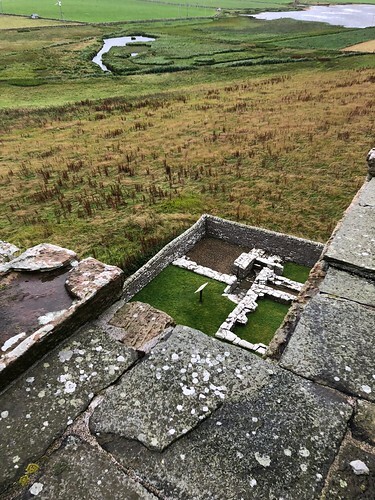 The two buildings are all that is visible of who knows how much more. 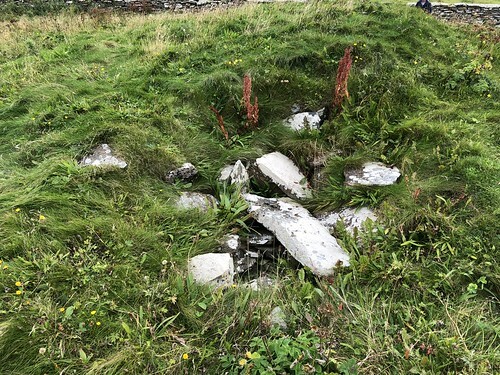 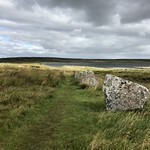 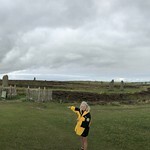 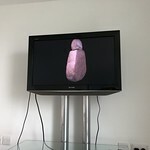 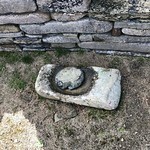 And secondly the Holm of Papa, a tiny island off Papay where there are two cairns, the most impressive of which, the South Cairn, with a new concrete roof, includes in its SE chamber three wonderful neolithic carvings. 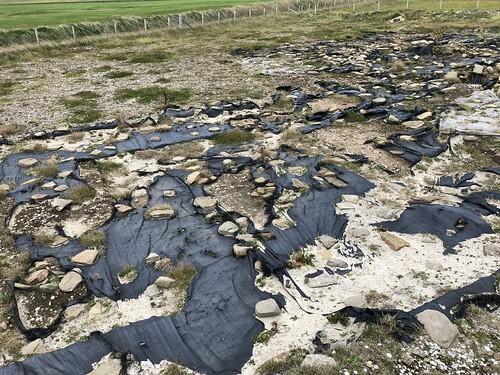 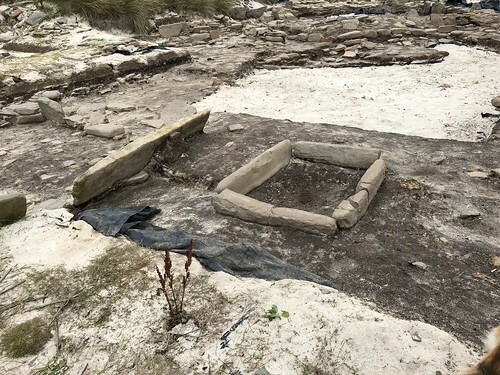 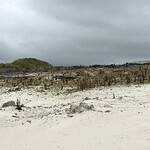 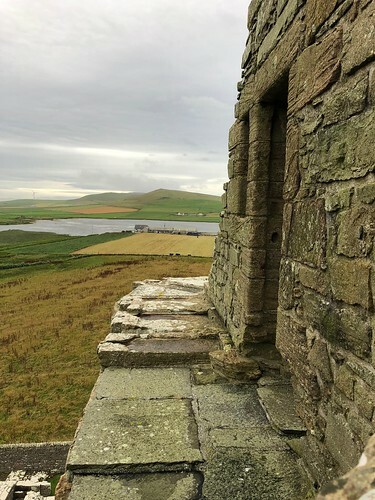 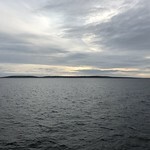 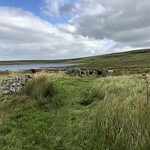 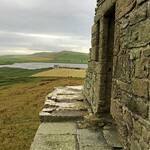 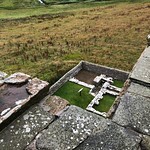 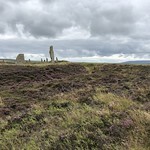 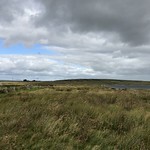 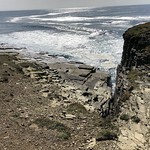 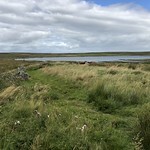 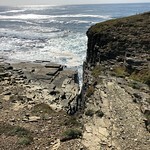 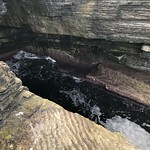 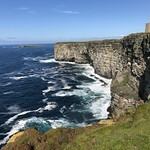 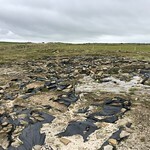 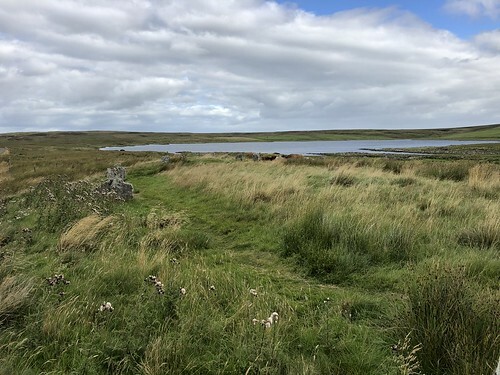 It is likely, in the fourth millennium BC, that the sea-level was lower, and the Holm of Papa a rise, beyond a low-lying, possibly marshy area of Papay, rather than a separate island. 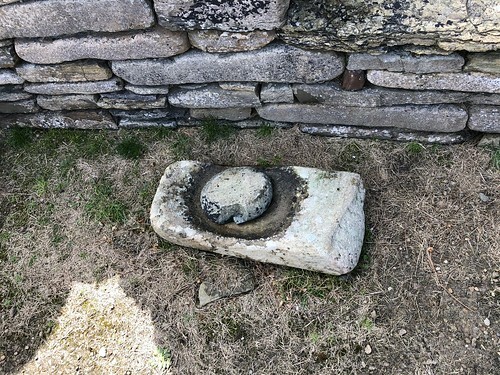 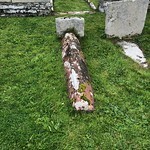 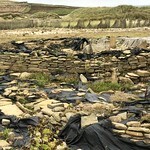 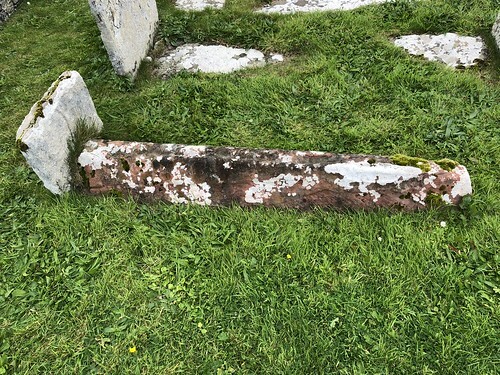 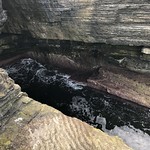 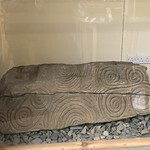 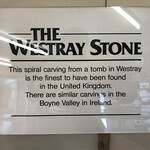 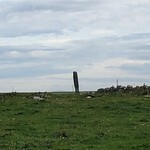 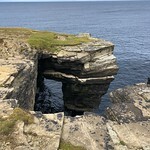 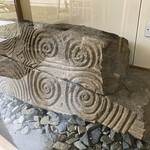 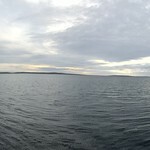 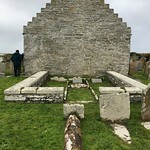 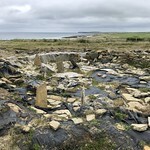 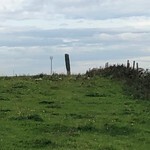 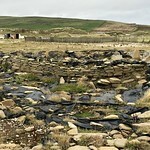 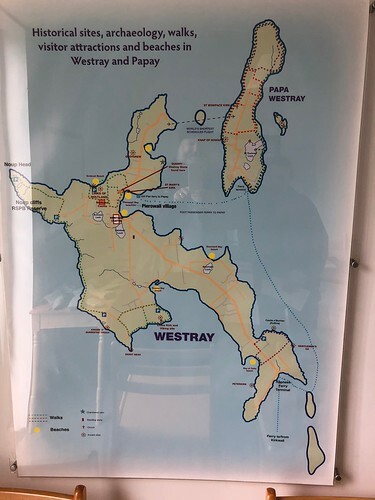 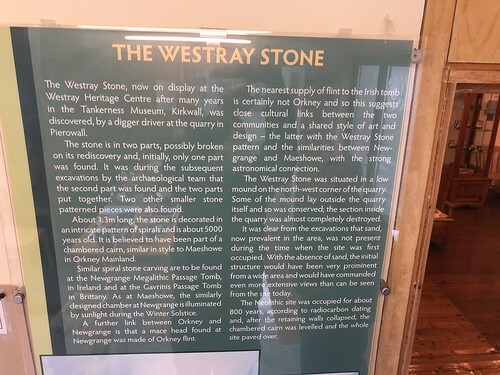 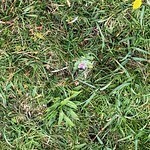 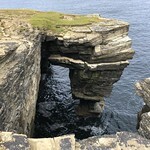 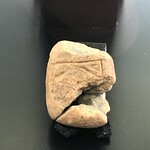 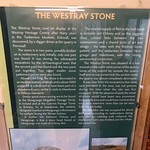 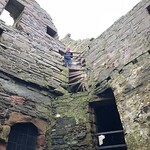 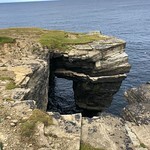 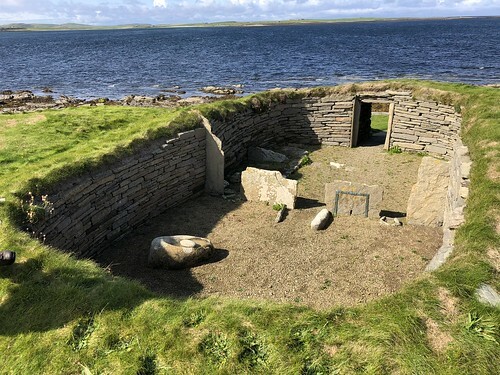 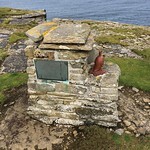 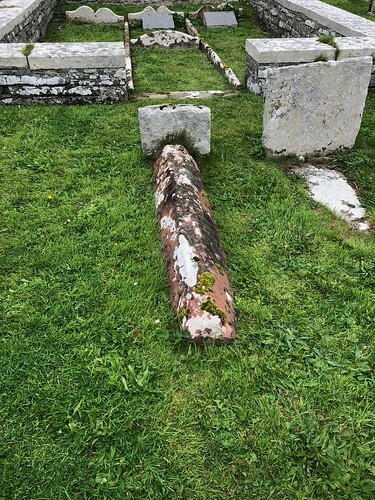 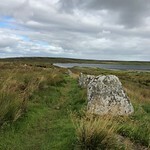 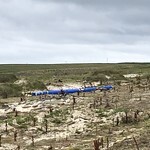 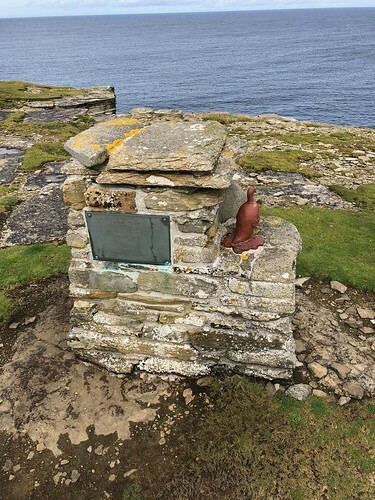 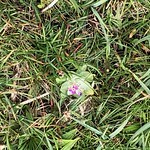 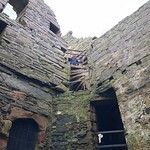 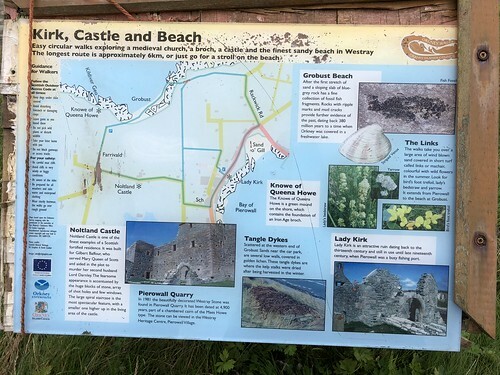 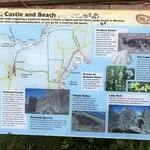 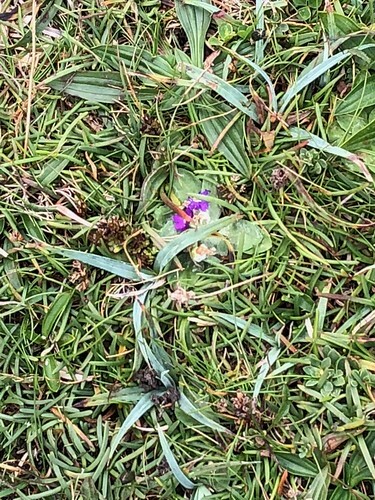 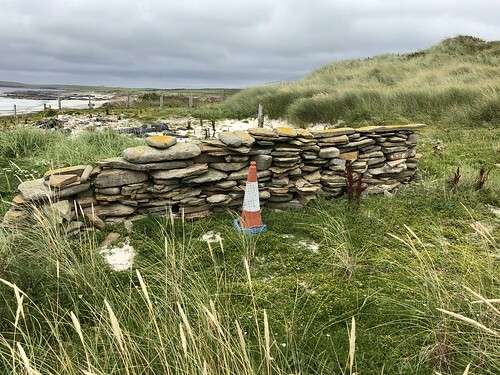 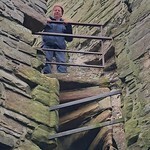 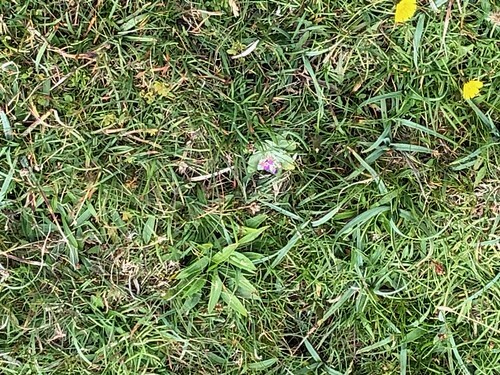 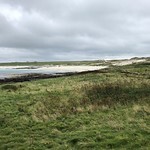 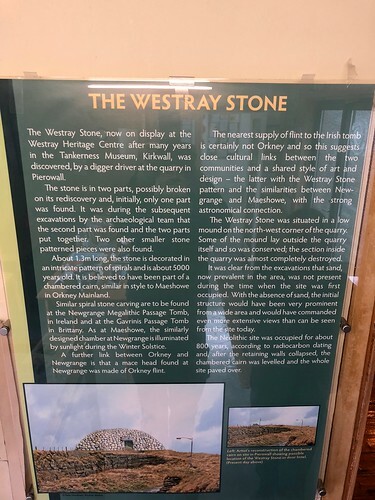 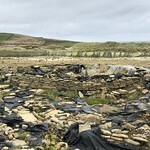 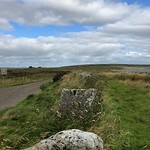 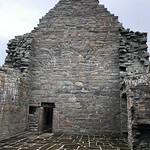 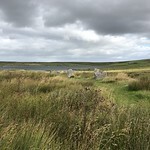 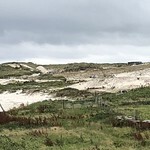 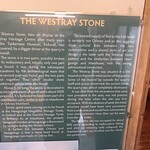 It is possible even Papay was connected to Westray. 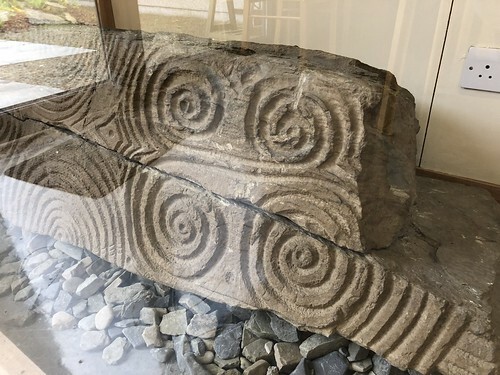 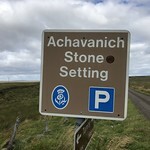 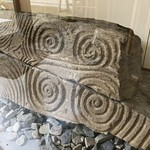 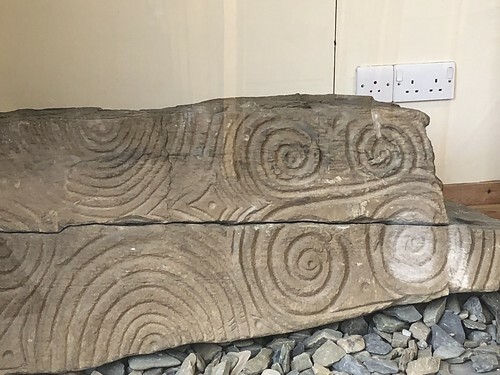 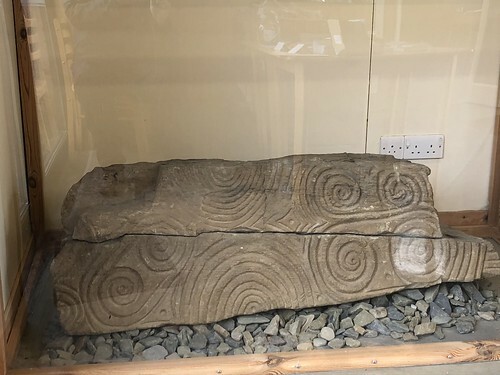 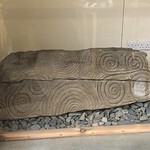 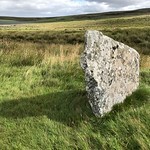 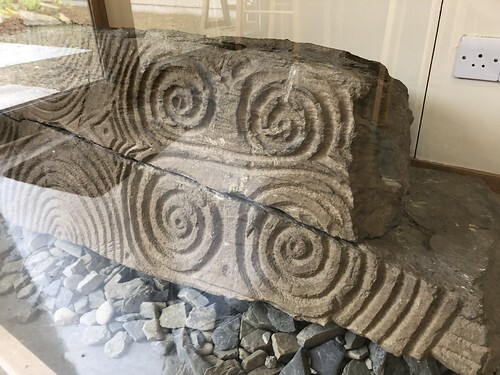 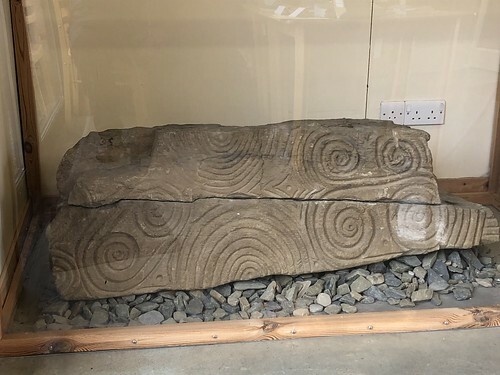 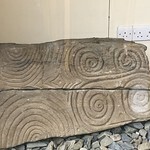 The carvings in the cairn, along with chevrons and dots, also display the ‘eye-brow’ motif common to many of the decorated stones in this area.